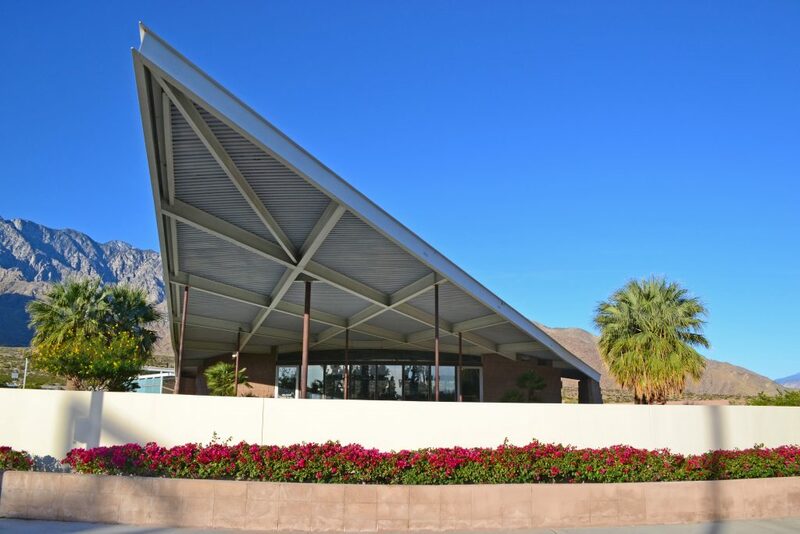 With its soaring A-shaped roof, the Palm Springs Visitors Center is an iconic slice of mid-century modern architecture situated in the desert a mile or so from town. 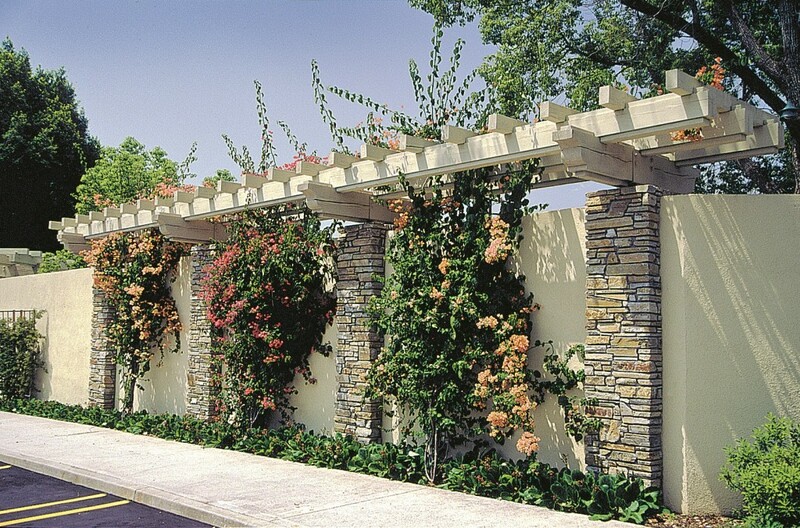 Softening its angular exterior is a semi-circle of brilliant fuschia bougainvillea bordering a desert garden facing the front door. 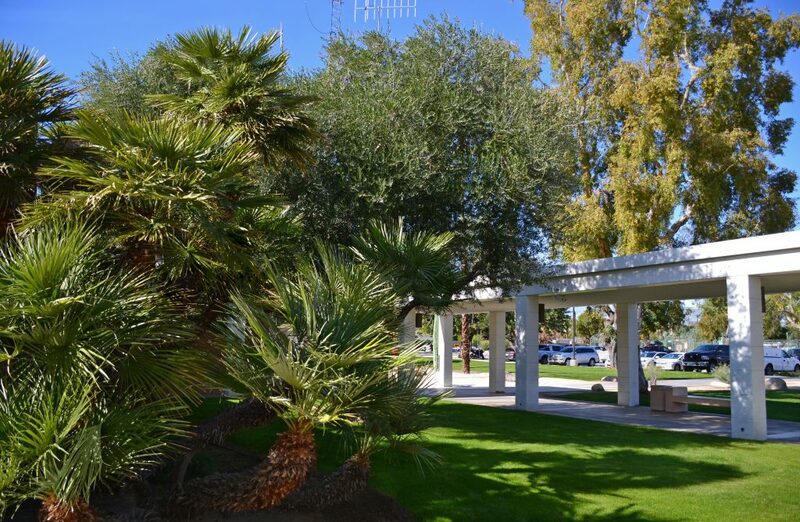 Majestic date palms stand sentry on either side of the building, as well as around the colorful garden oasis just beyond the Center. 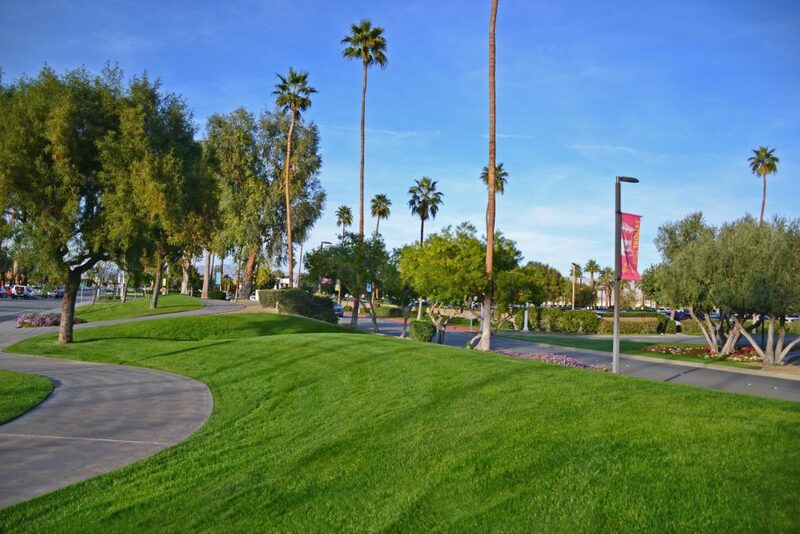 The lush green lawn and bright bougainvillea in the oasis is a welcome sight after miles of khaki desert. 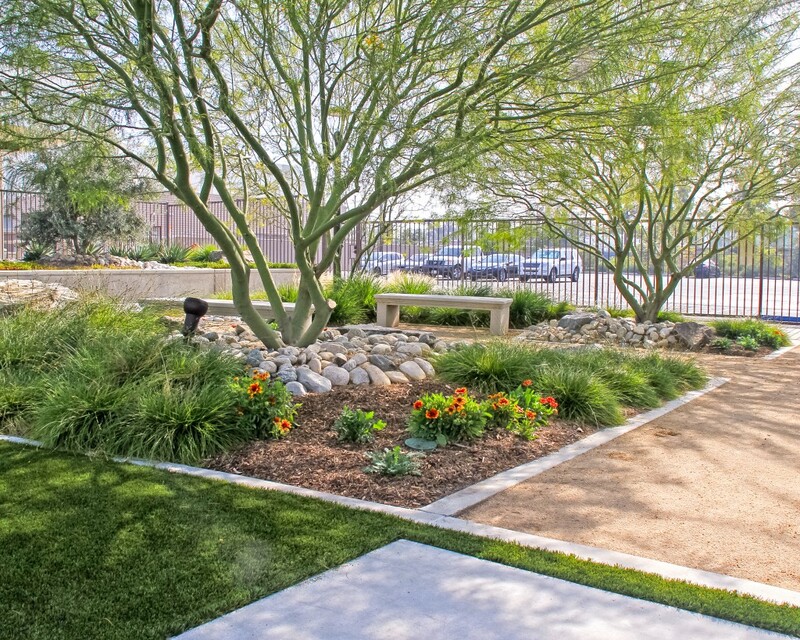 Behind the beauty of the healthy turf and shrubs is a team of landscape experts and the masterful use of adaptive irrigation. 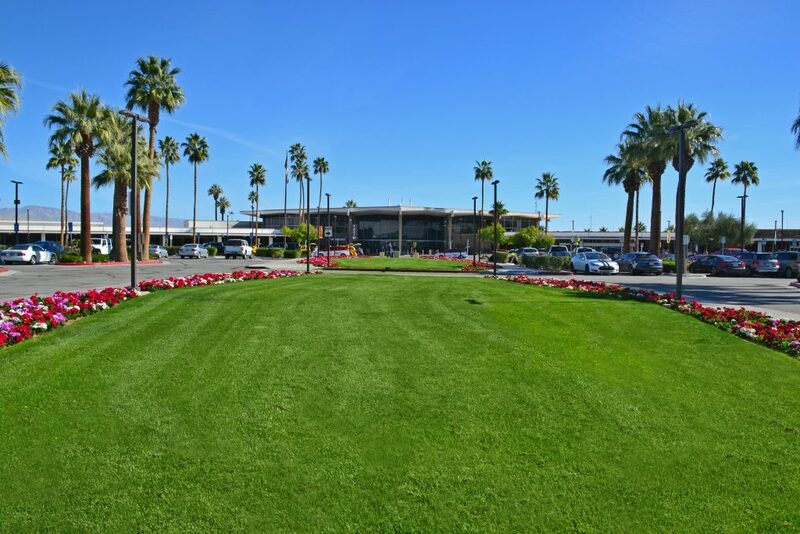 From a single small runway in the 1920’s that catered to El Mirador Hotel’s exclusive clientele, to a 940-acre international airport in 1999 … this elegant portal welcomes travelers with its clean white architecture, sweeping green lawns, and lush beds of colorful flowers. 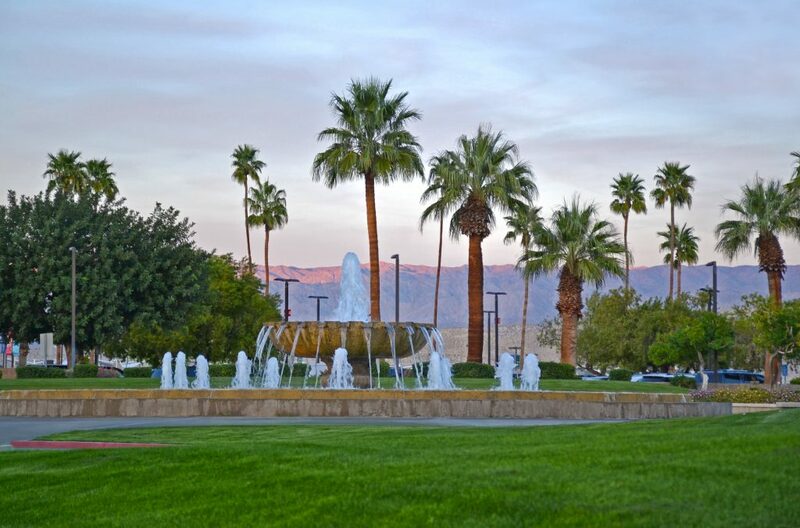 Towering palms and grassy slopes accompany winding paths and overlook a circular stone fountain gifted to the city from Mexico. 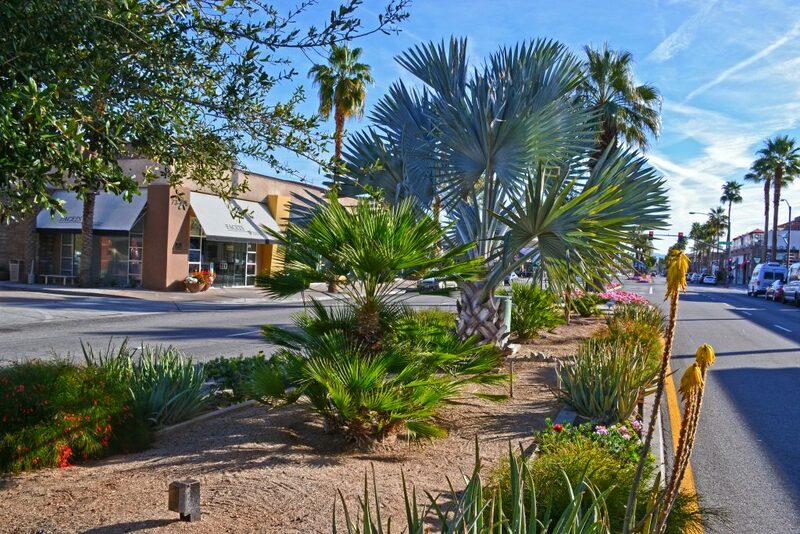 Mariposa’s dedicated teams keep the many landscapes manicured, clean, and healthy. 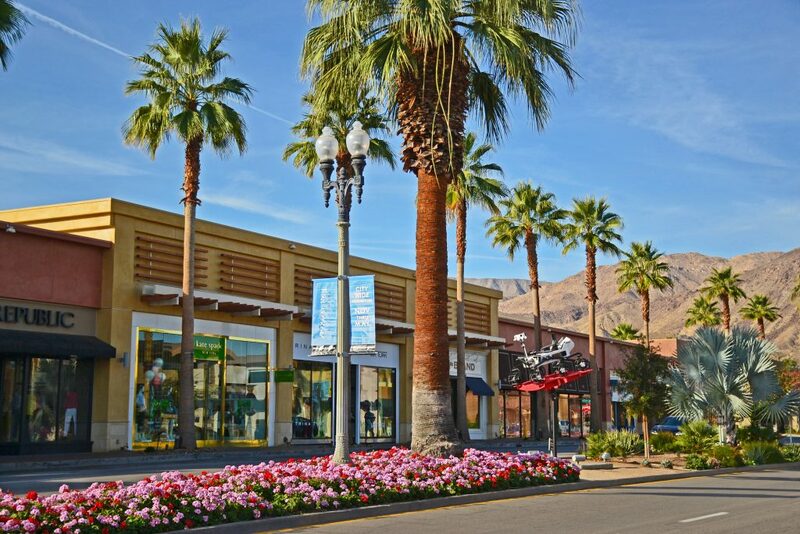 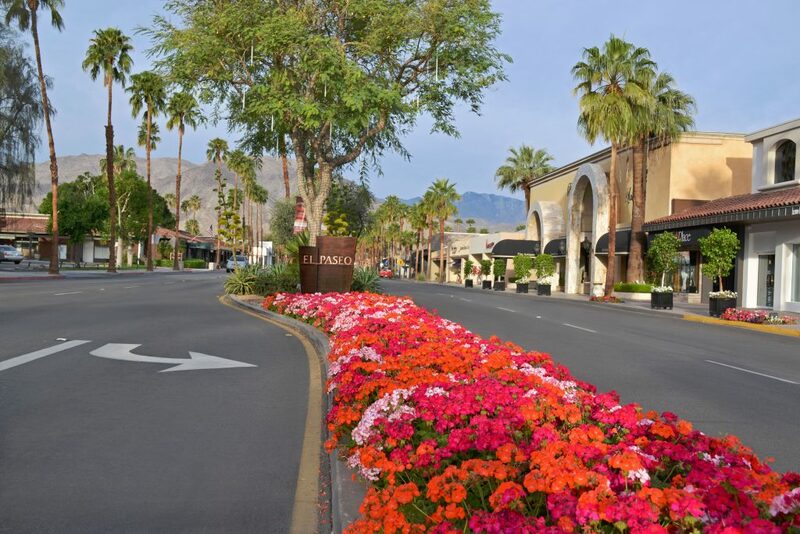 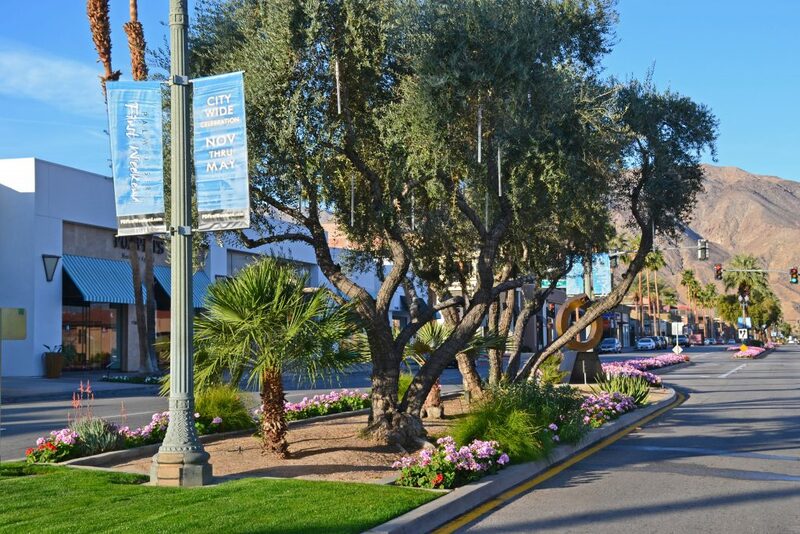 Famously known as the “Rodeo Drive of Palm Springs”, this one-mile long restaurant and shop-lined street is enhanced by a dramatic and verdant median. 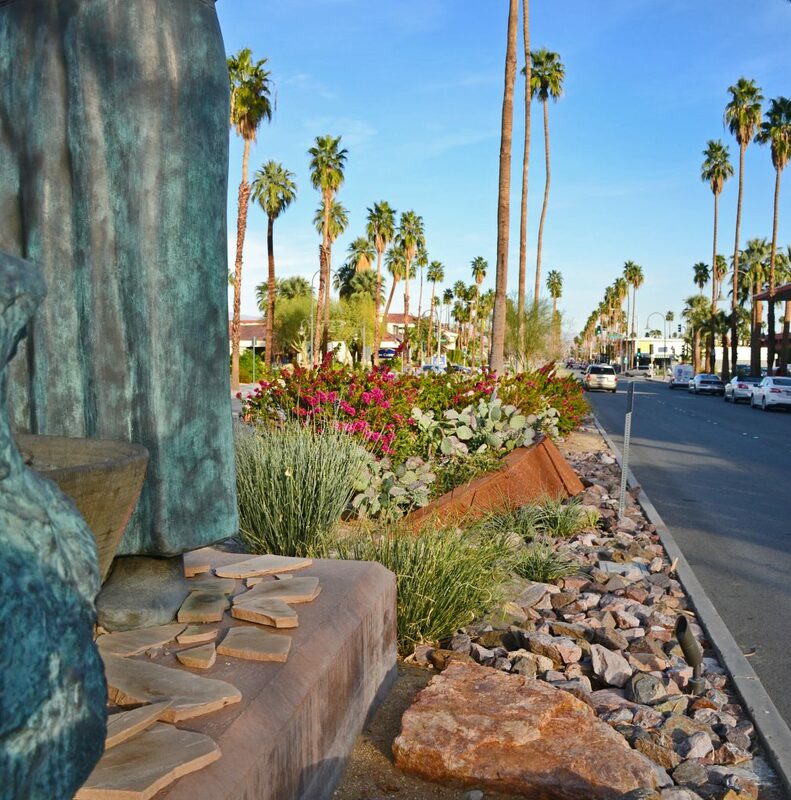 Maintained by Mariposa, this median boasts seasonal annual flowers in bloom, a variety of native and desert-friendly succulents, trees and sculptures. 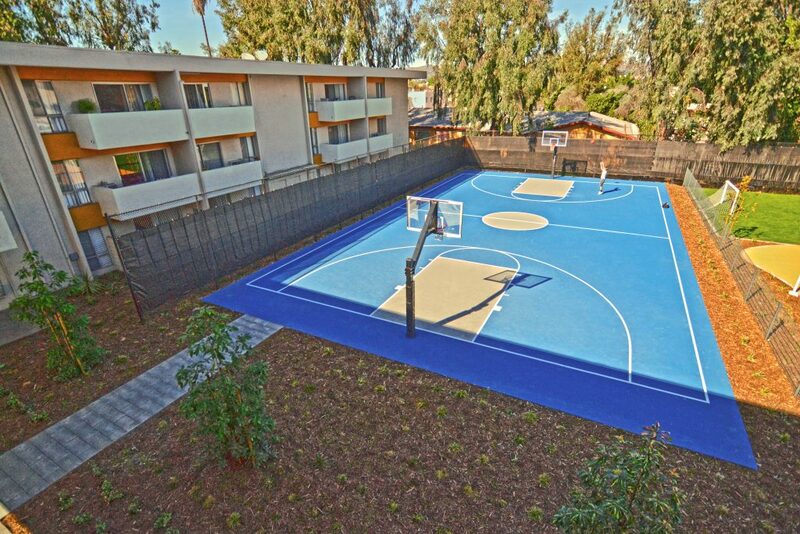 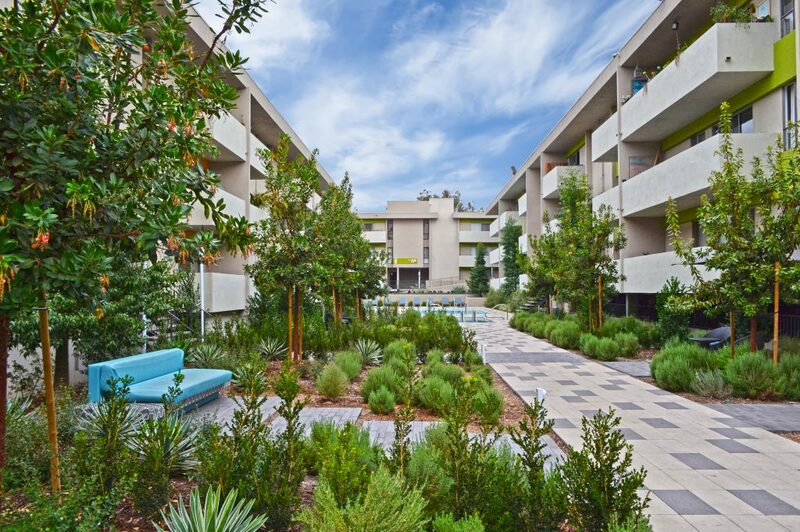 The Chadwick Apartments is a 600-unit luxury complex near downtown Los Angeles, whose outdoor spaces were completely redesigned for modern, communal living. 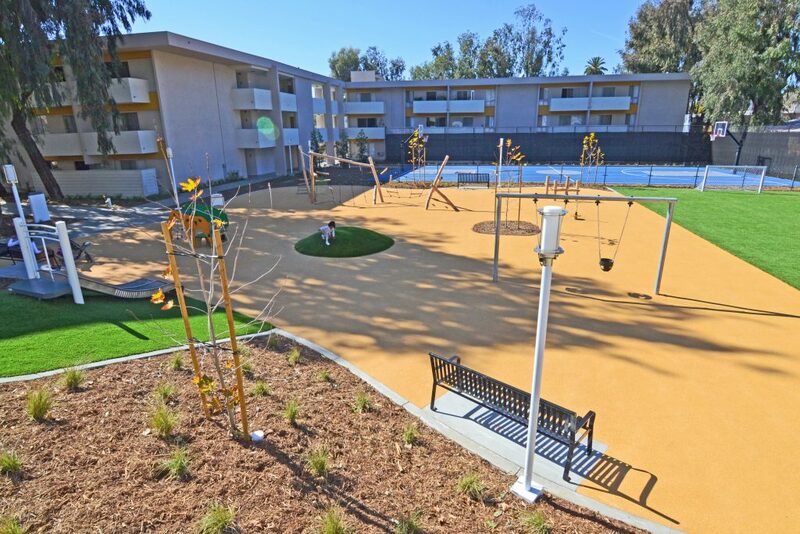 Mariposa was contracted to install the complex and extensive landscape design which embraced all gardens, borders, common areas, two pool areas, four recreation spaces, and interior/exterior corridors. 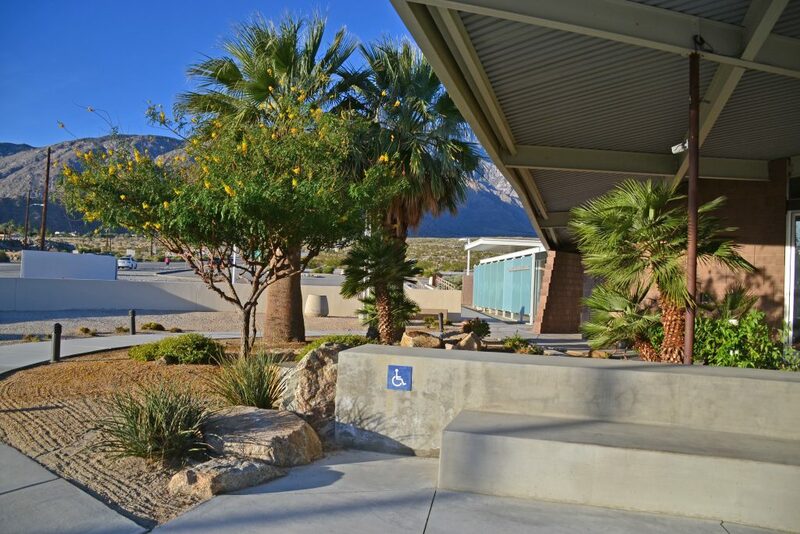 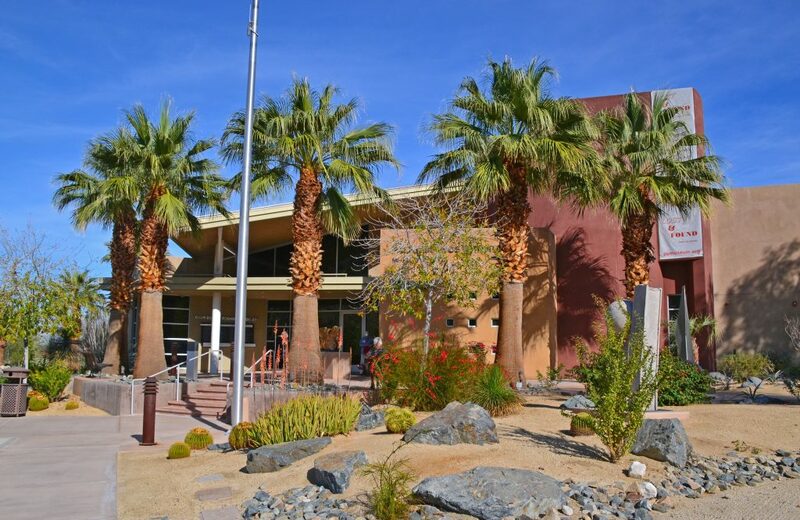 The project required a comprehensive new irrigation system, and the installation of expansive tile paver walkways and pool surrounds, as well as swaths of colored gravel with large potted plants and trees in outdoor corridors. 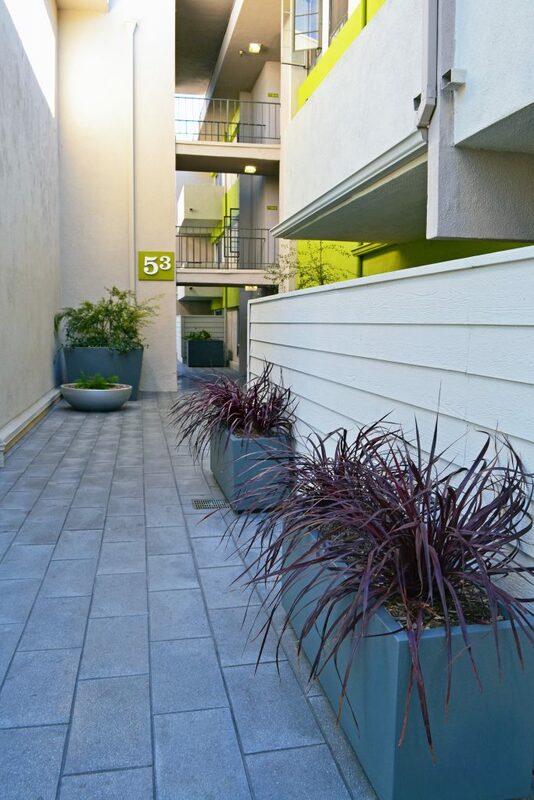 Indoor corridors were brightened with large, distinctive pots and colorful plant materials. 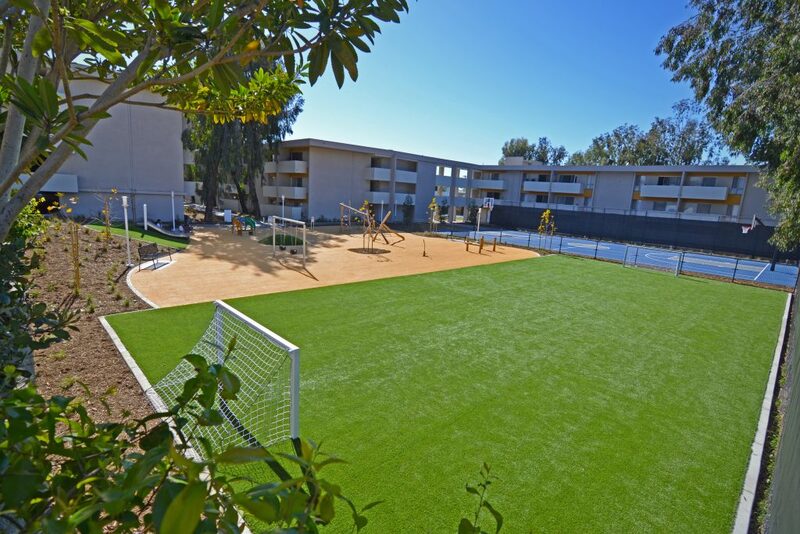 The final stage of the project included installation of a soccer field, and new gardens adjacent to a soft-surface playground, and basketball and tennis courts. 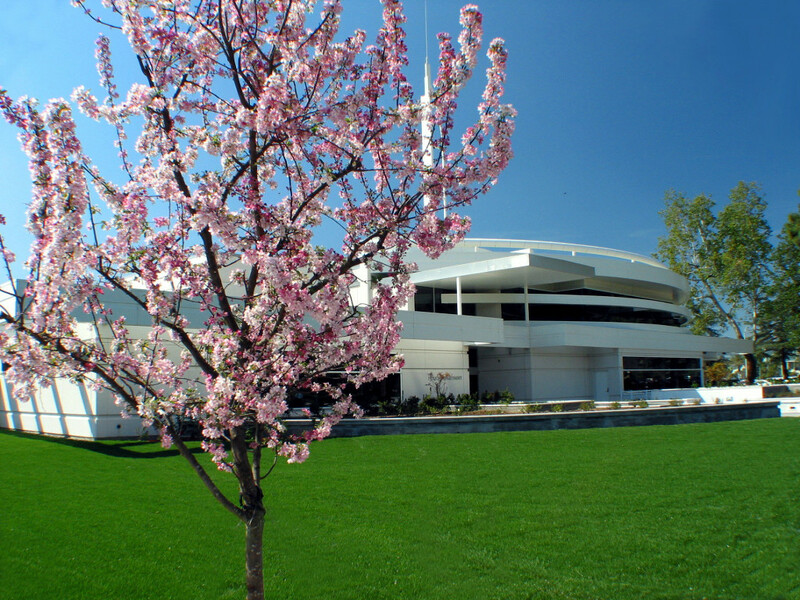 Crowell Library in San Marino, California is set with peaceful landscape surrounding the building and parking area.The library, designed originally by Herbert J. Powell, opened in December 1951. 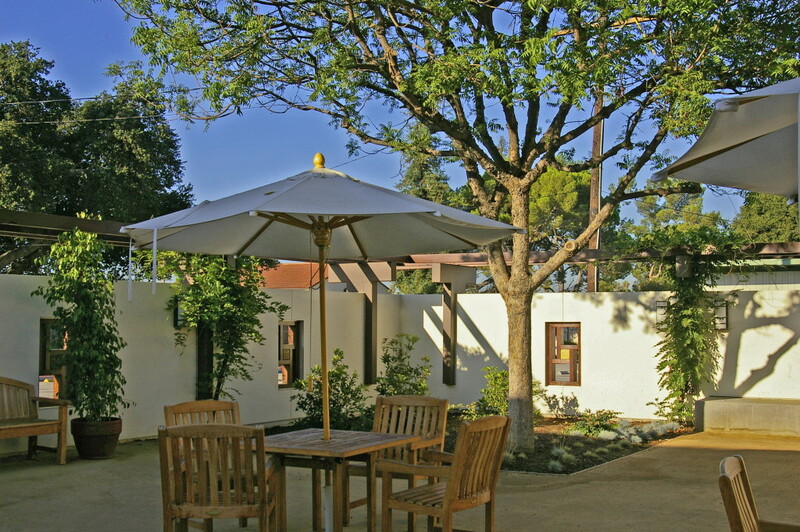 Its architectural style combined traditional Spanish elements with a modern look. 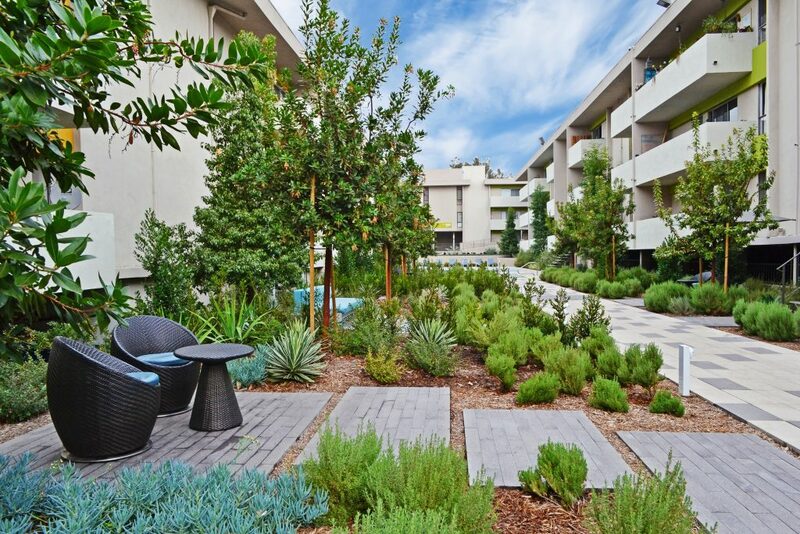 Work included an outdoor seating area for guests who enjoy reading or studying in an outside environment, new irrigation systems, planting of shrubs, plants and trees. 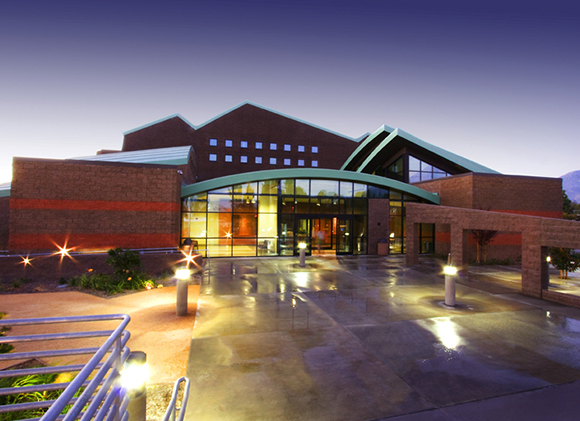 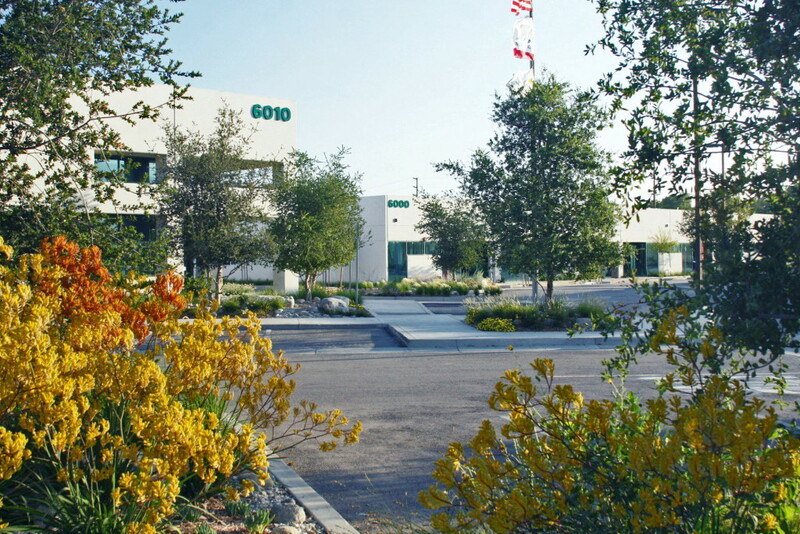 The Gateway Center Complex is a large corporate campus training facility for Southern California Edison located in Irwindale, California. 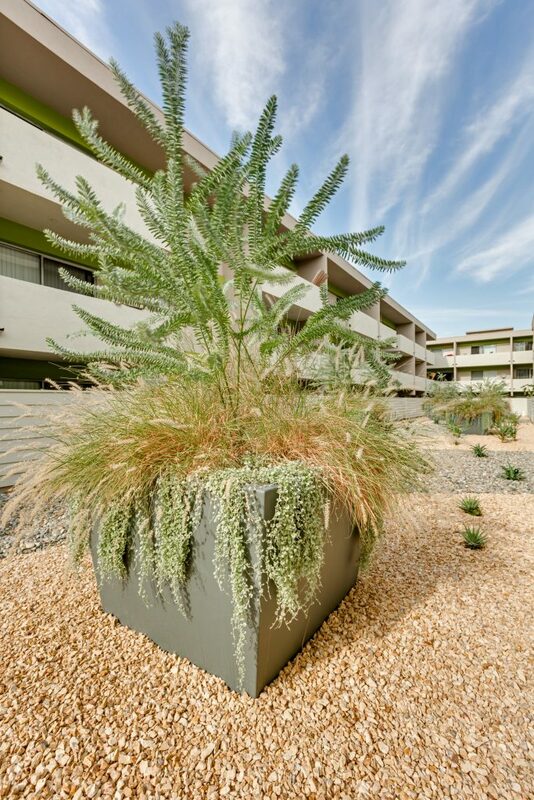 The project is special in that it showcased environmental sustainability and was featured in Landscape Architectural Magazine. 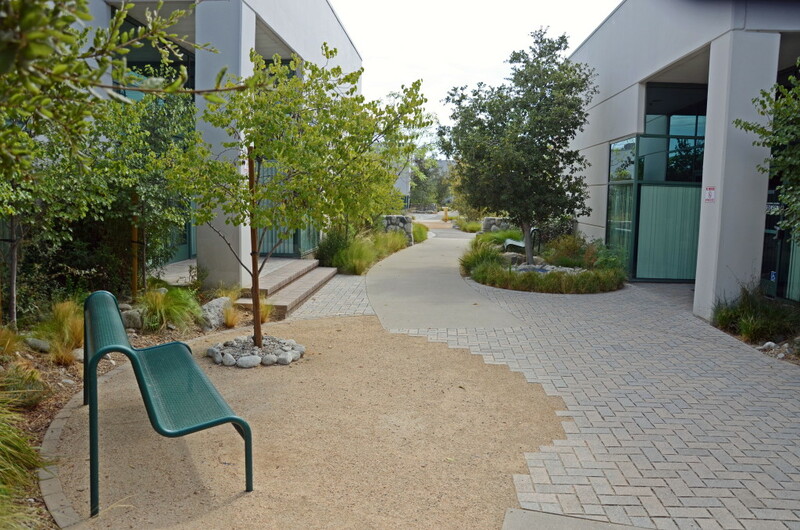 Our work included hardscape rock, work, pervious concrete, masonry, pedestrian walkways, cobble drainage structures, permeable pavers, native adapted planting, and drip irrigation systems. 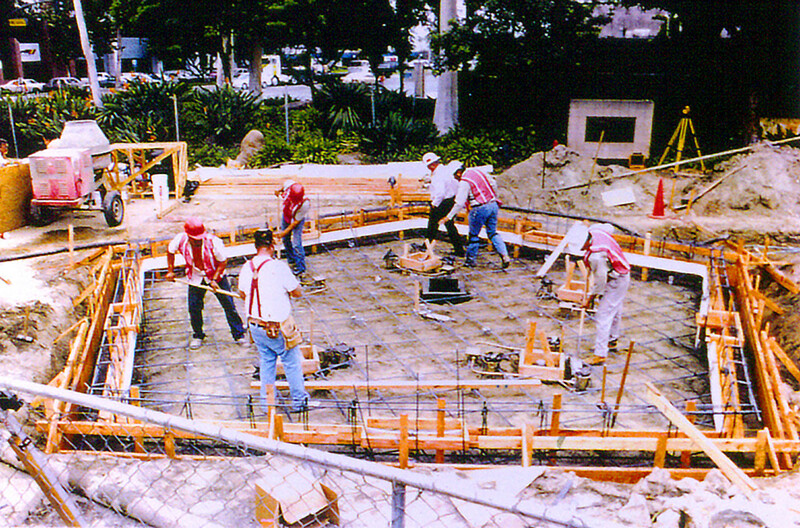 The Veterans Memorial Fountain in Santa Fe Springs is a poured in place concrete structure with granite masonry. 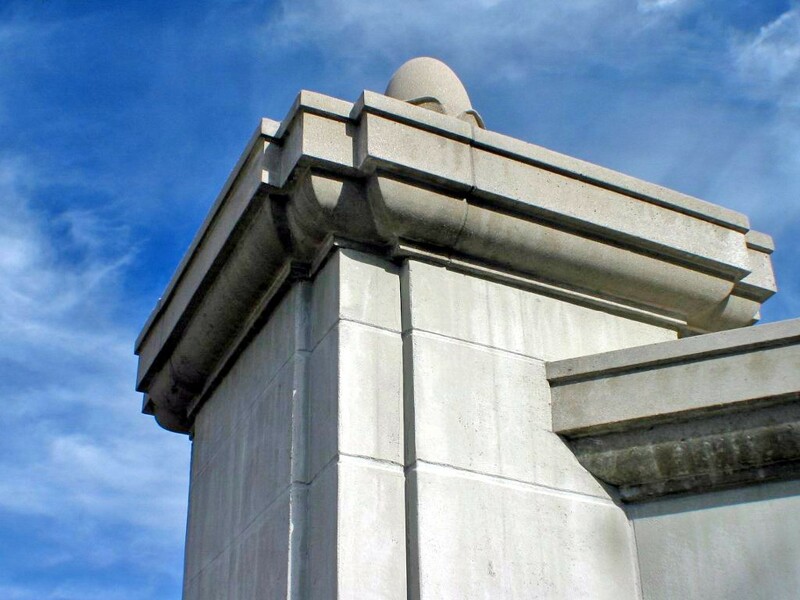 The memorial was built under an accelerated schedule with very tight tolerances to accommodate the precut polished eight-hundred pound cap stones. 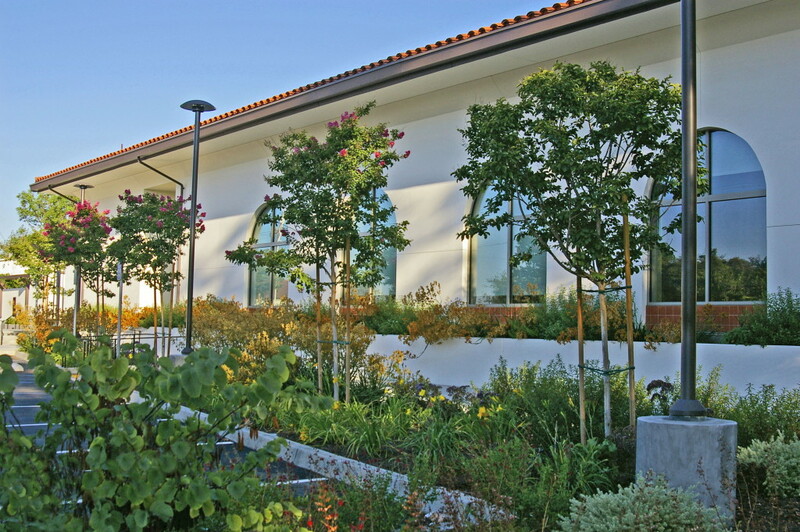 Work included concrete, masonry, pump and fountain plumbing as well as surrounding landscape plantings. 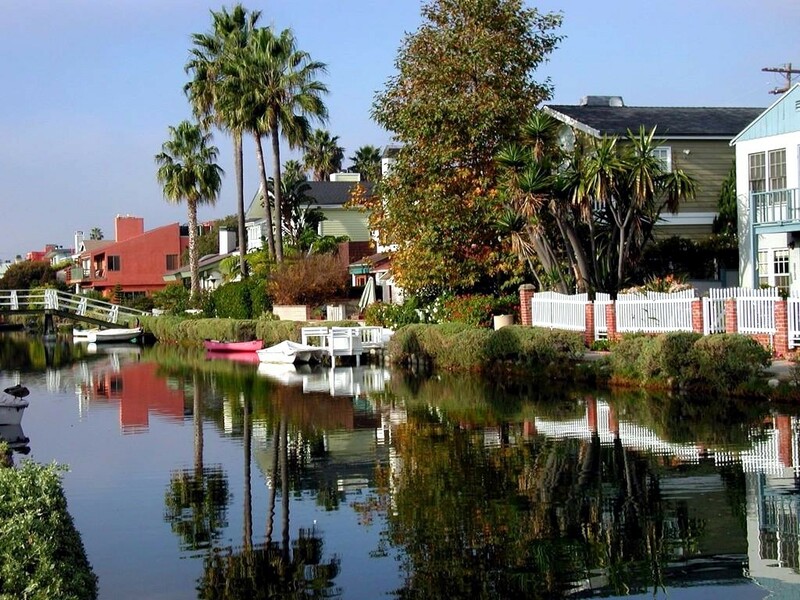 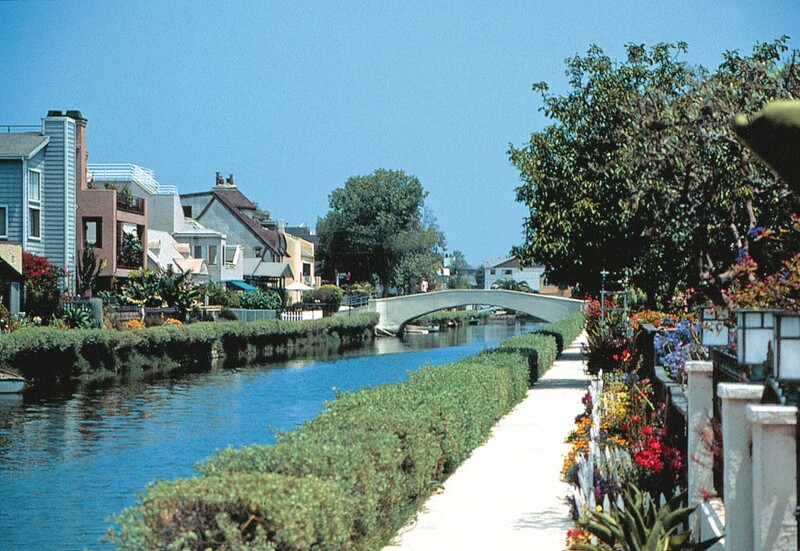 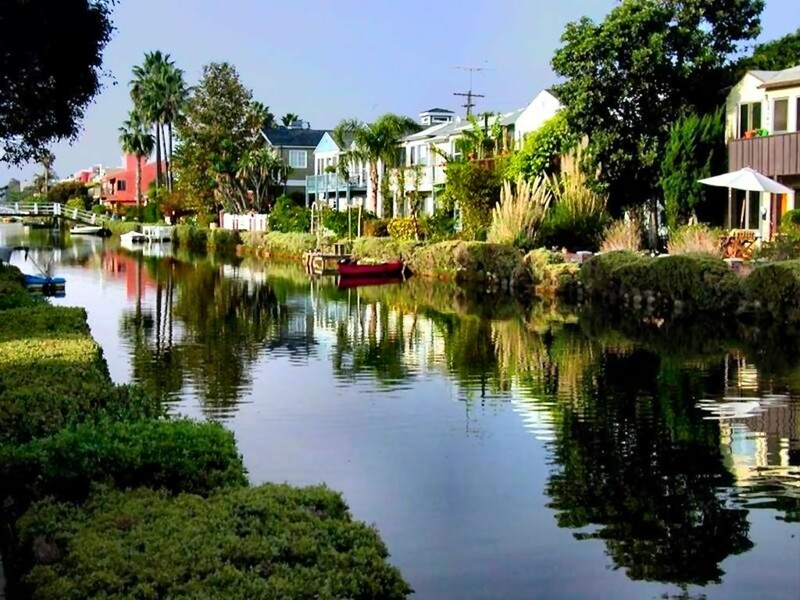 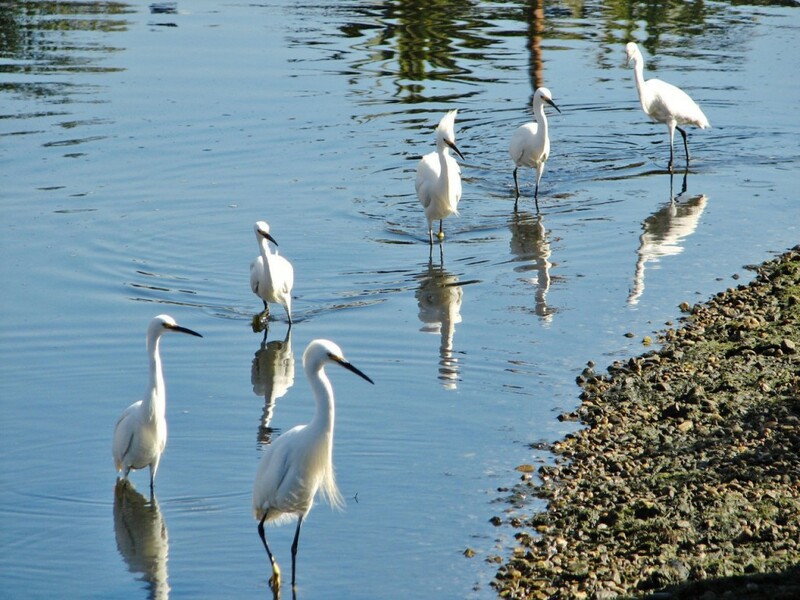 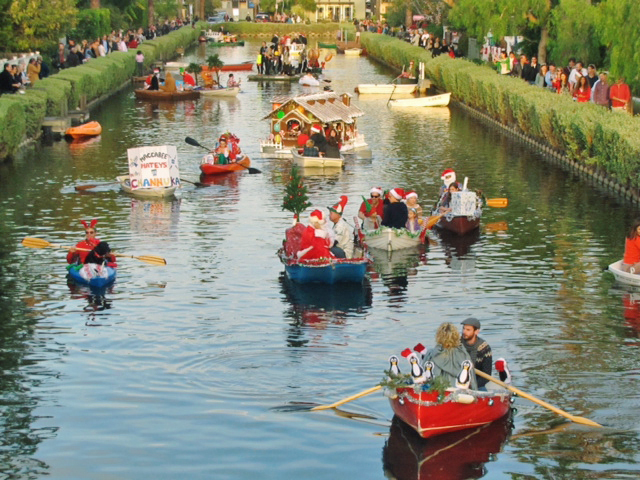 This project is the maintenance of the landscape shrubs and aquatic weed control in the historic Los Angeles Venice Canals located in Venice Beach, California. 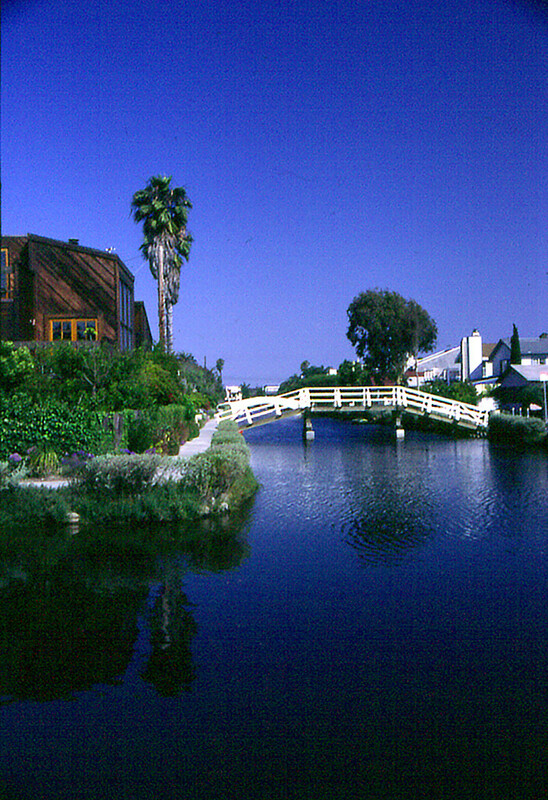 This is a very unique landscape maintenance project in that it requires us to control the gates on the canals to time the filling and flushing of the ocean water with the cycles of the tides. 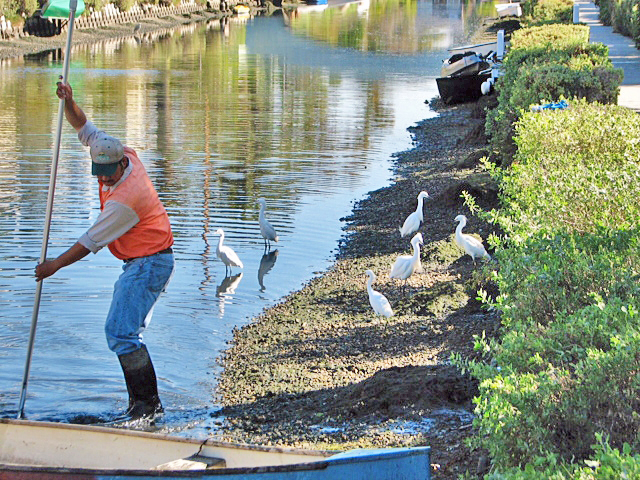 Along with trimming the shrubs and cleaning the landscape area along the canals, we manually harvest the algae and control the aquatic plants in this environmentally sensitive habitat. 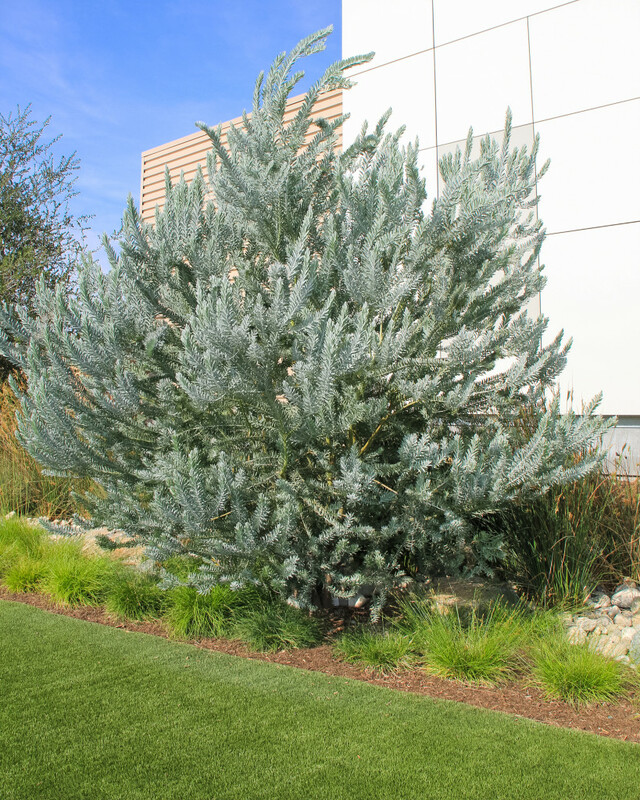 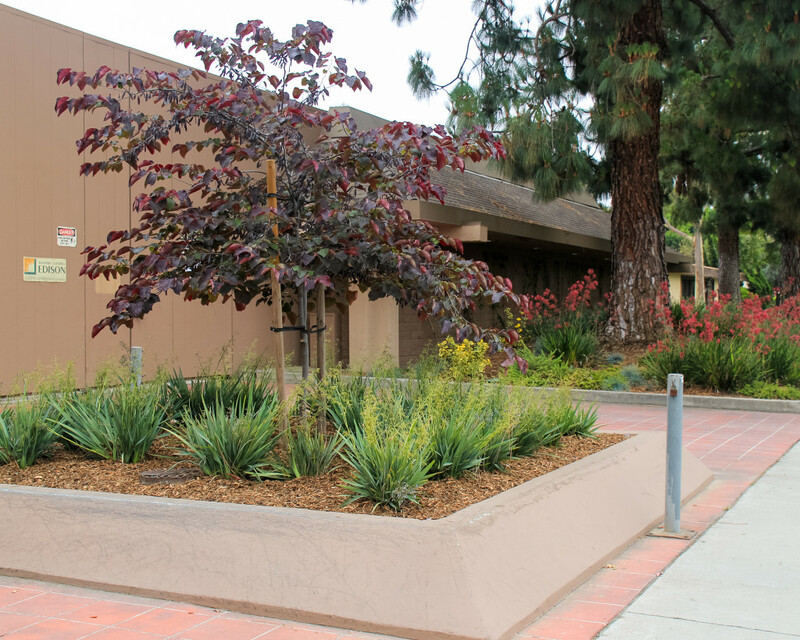 This water saving renovation project was at a Southern California Edison Service Center located in Ontario, California. 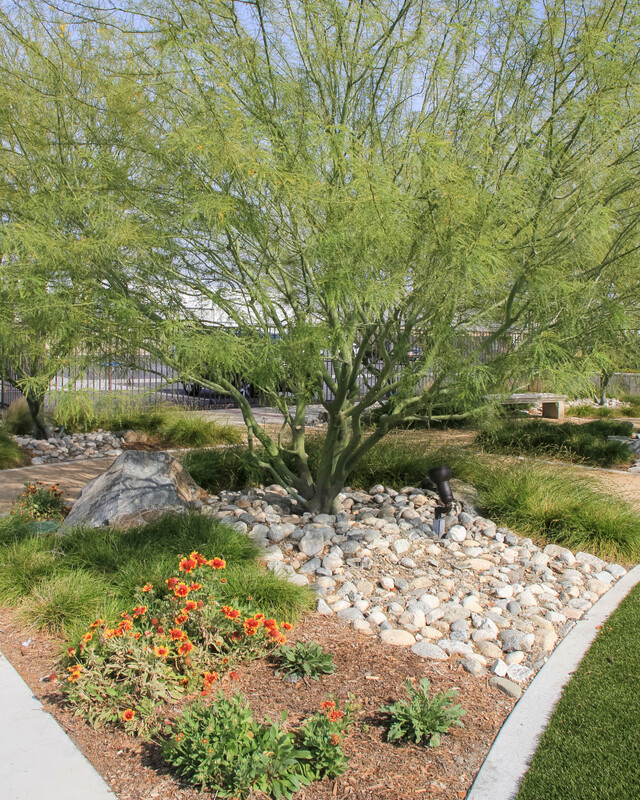 Work involved removing the existing grass, building cobble stone drainage structures, artificial turf, concrete edging, lighting, planting a large variety of native adapted trees and shrubs as well as a “Smart” irrigation control system. 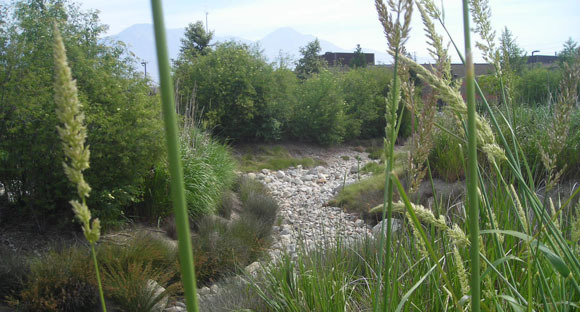 The work was completed under an accelerated schedule. 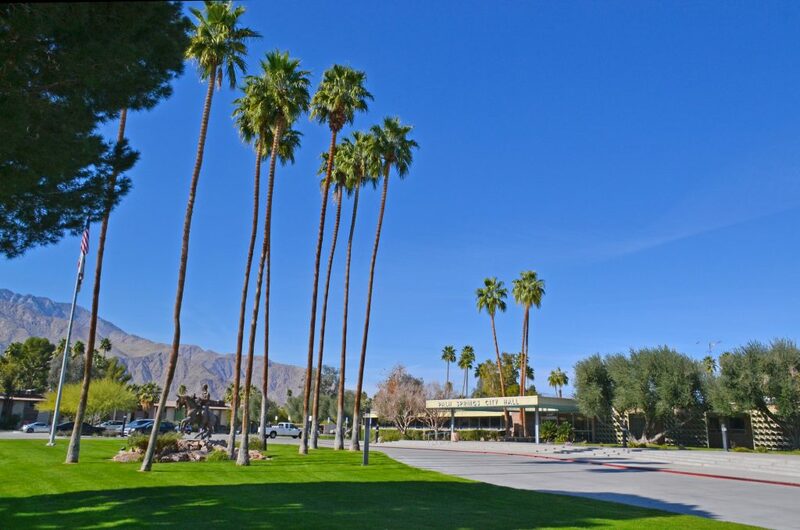 Founded in 1904, the San Gabriel Country Club is a historic landmark in the San Gabriel Valley. 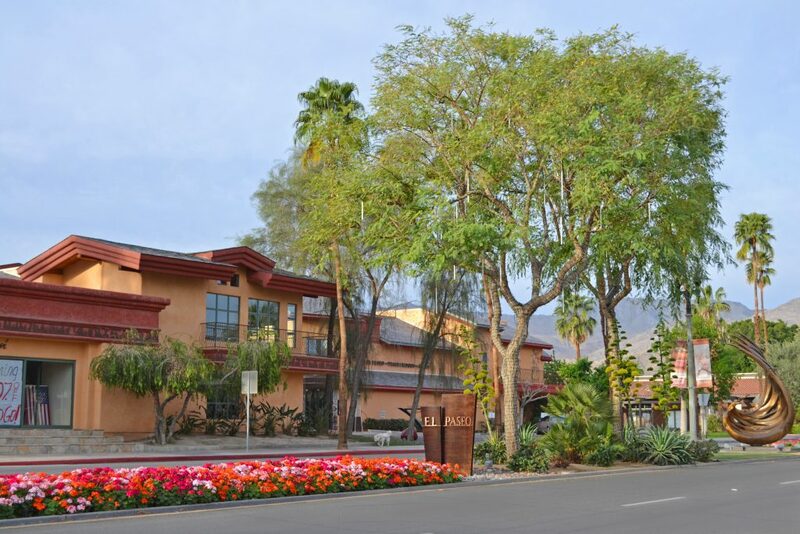 The landscape renovation work included the areas around the clubhouse as well as building a completely new patio and dining area with custom masonry, concrete and a focal point water feature. 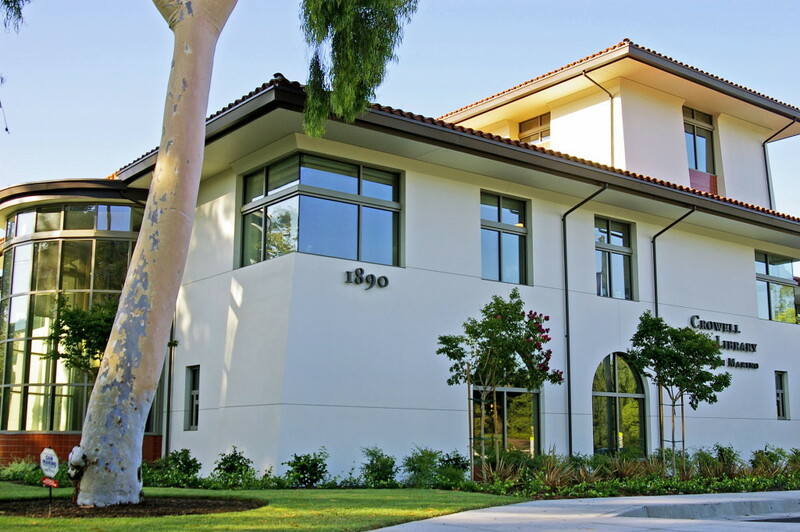 Located in Claremont, California at the prestigious Pomona College – Member of the Claremont Colleges. 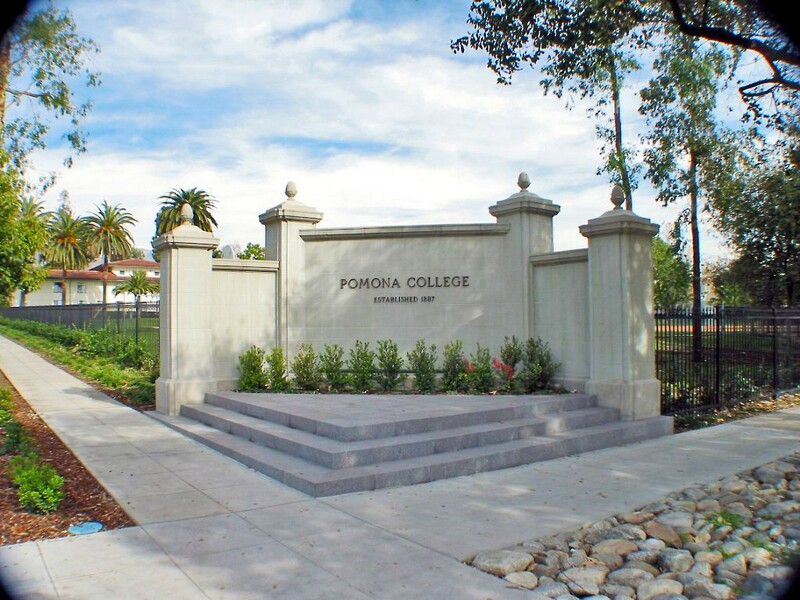 This project at the southern entrance to the College involved the replication in design and theme of the college monument at the northern entry which was built in 1908. 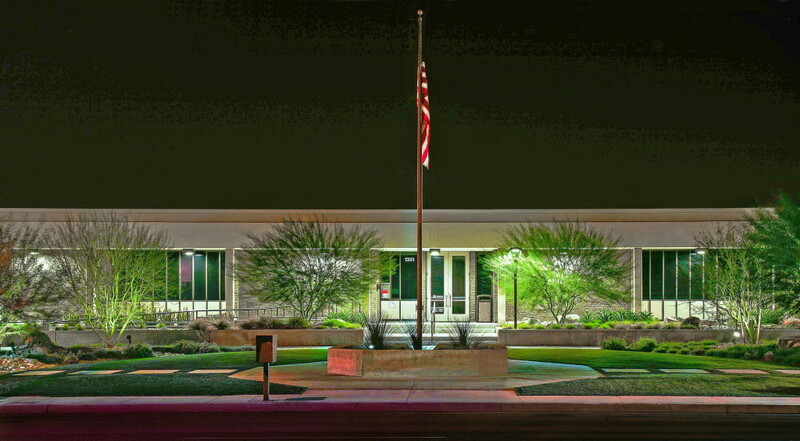 The work required special masonry techniques and custom precast elements. 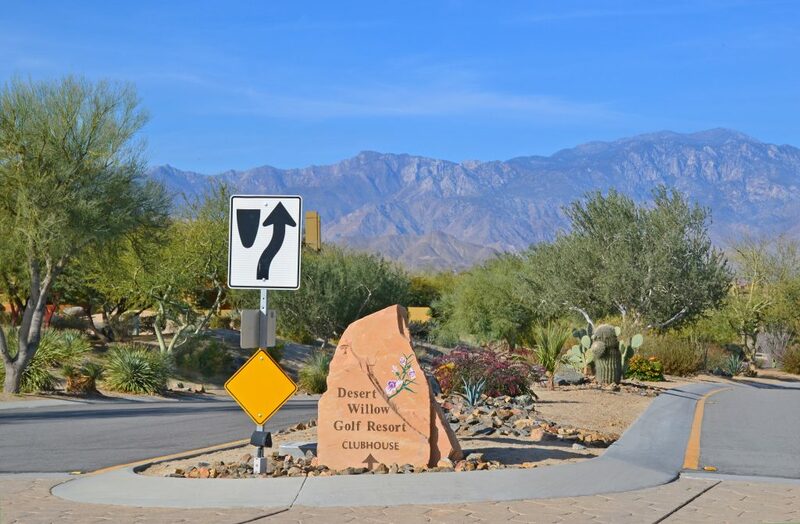 EPT Landscape Architects designed the sign and associated landscape. 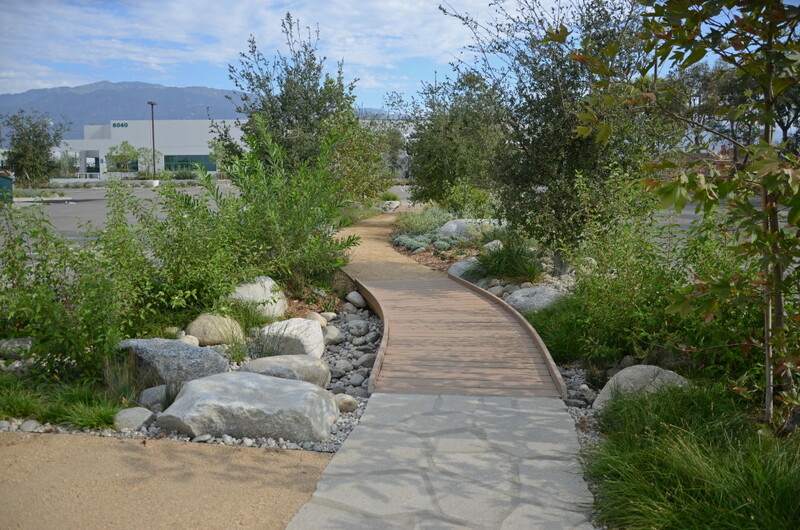 Mariposa built the sign and installed all of the associated landscaping. 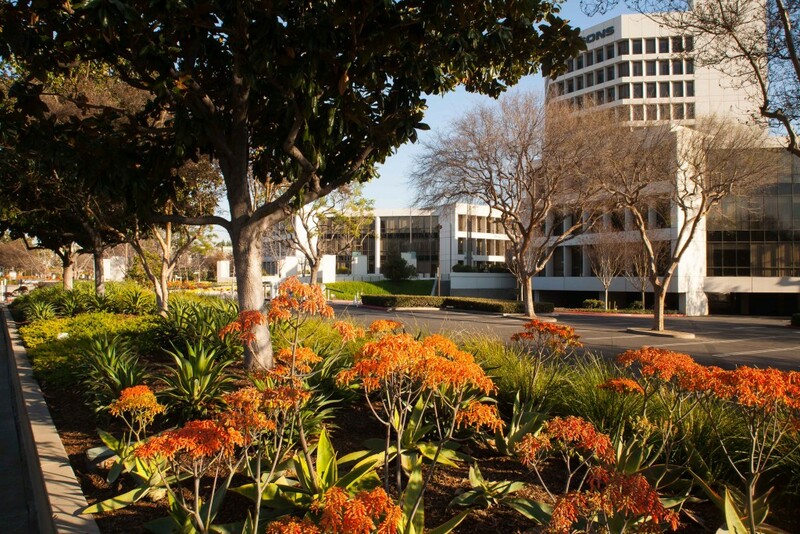 We have maintained this beautifully landscaped twenty-two acre corporate campus for a number of years. 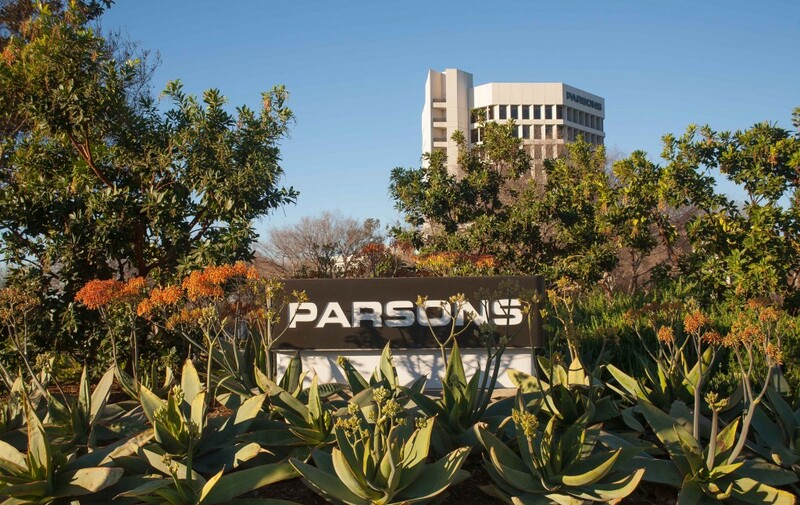 Located in Pasadena, California, this twelve-story office tower is home to the Parsons Corporation. 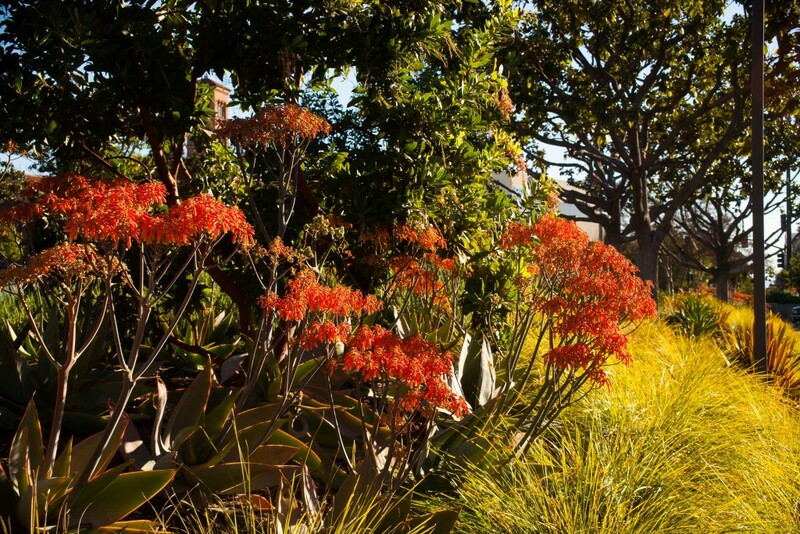 Full landscape maintenance and tree care is included in our work. 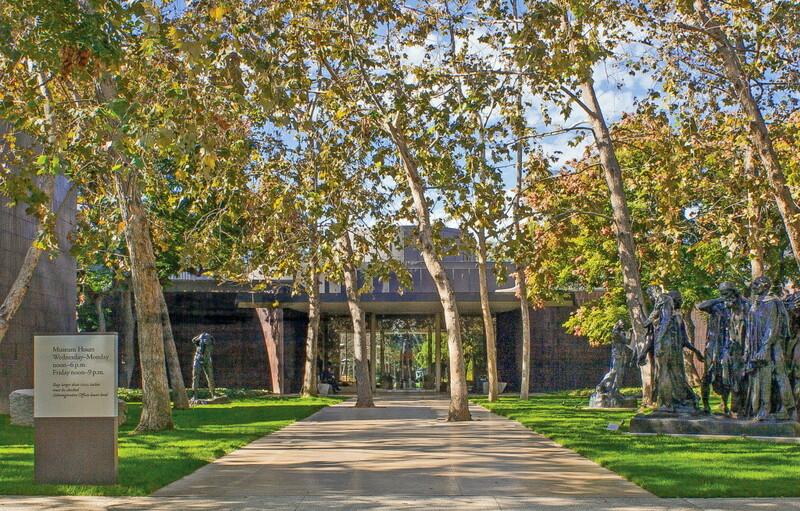 The Norton Simon Museum is a world-renowned art museum located in Pasadena, California. 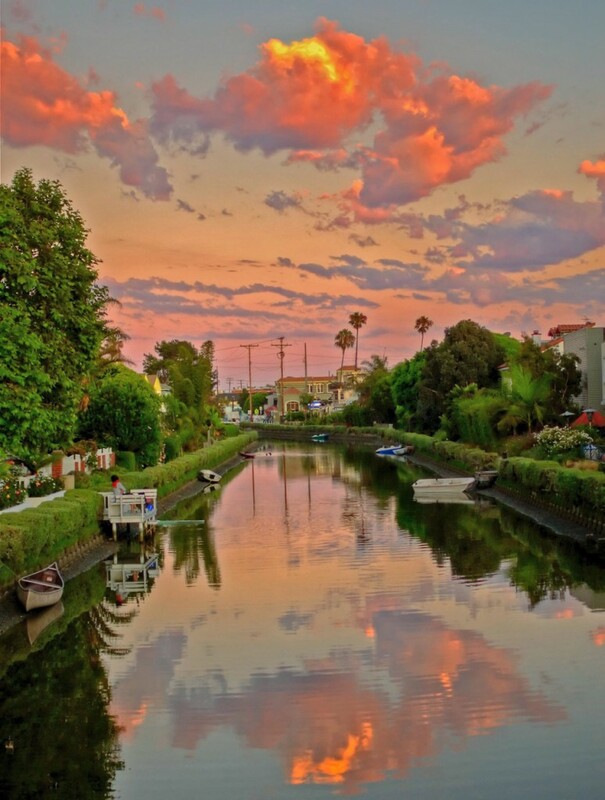 Most people know it from the aerial views seen from the start of the famous Rose Parade that is televised every New Years day. 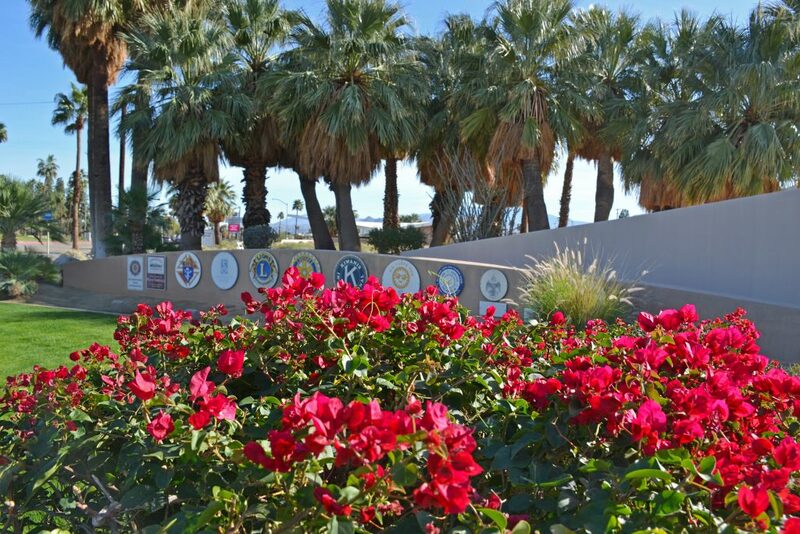 We have maintained the grounds on this property for many years, carefully doing our part to showcase the outdoor sculptures and artwork. 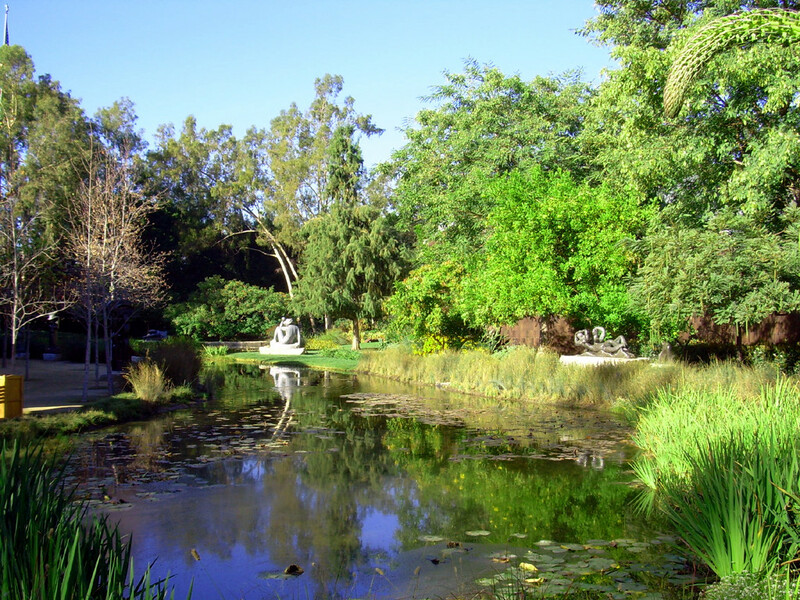 One of the interesting features of this property is our maintenance of the natural pond with aquatic plants and fish. 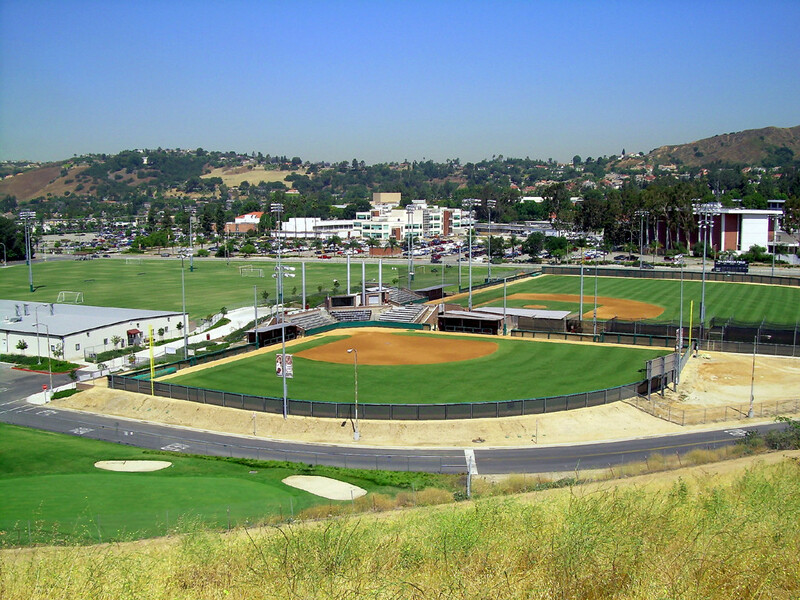 Located at Mount San Antonio College in Walnut California is this premier intercollegiate sports field complex. 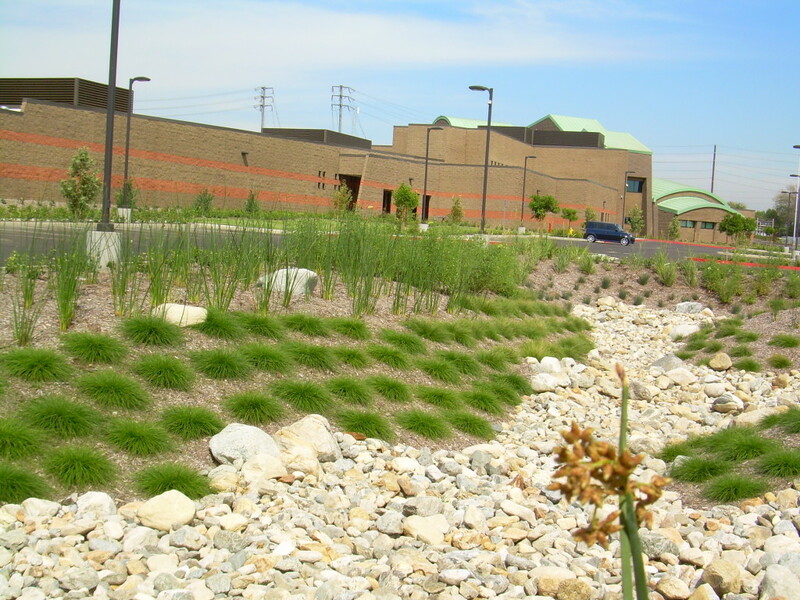 Our work included the installation of more than ten acres turf set over a sand base and seven miles of drain line. 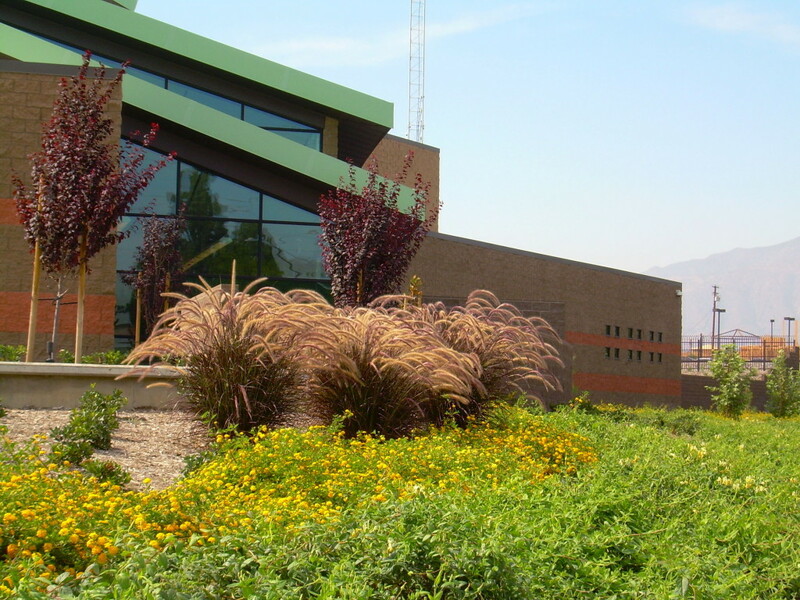 The irrigation system is a state-of-the-art central control system connected to the weather station on campus. 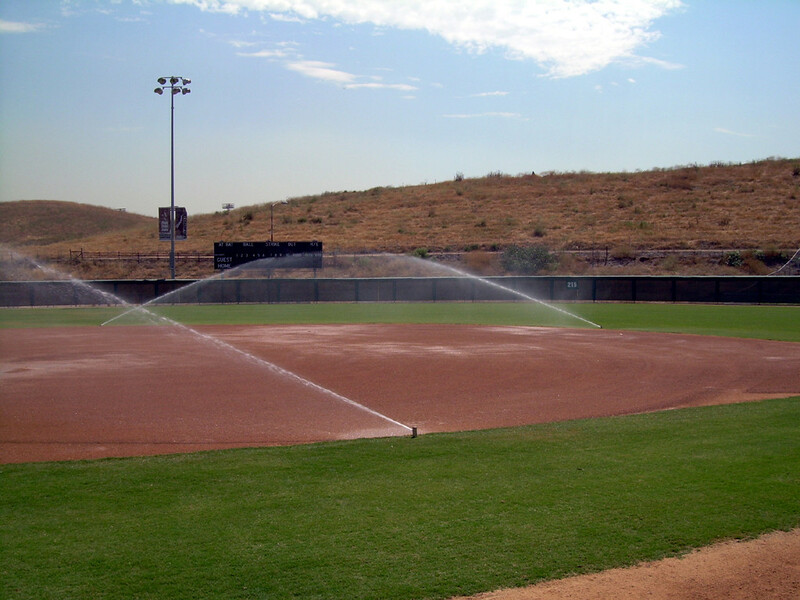 In addition to that, we built two NCAA regulation soccer fields, a baseball field and a softball field that included the infields and mounds. 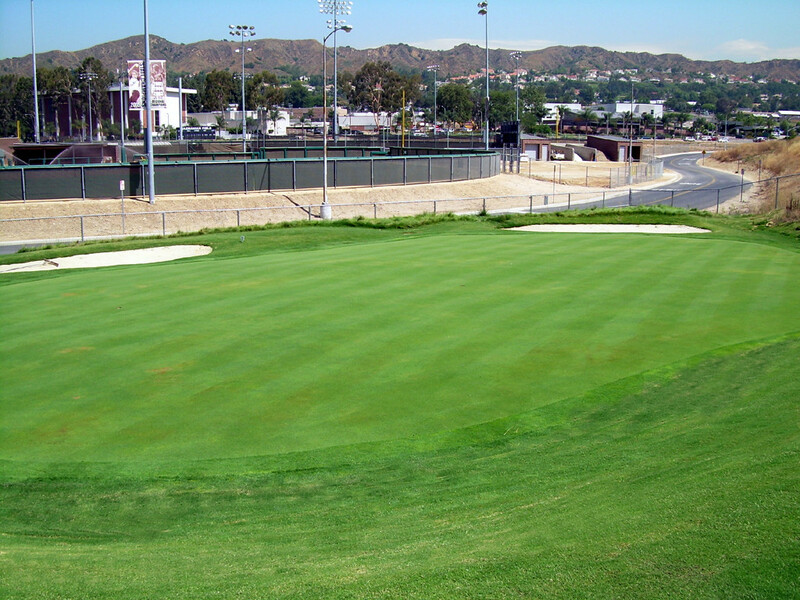 We also built two practice putting greens with sand bunkers to USGA standards. 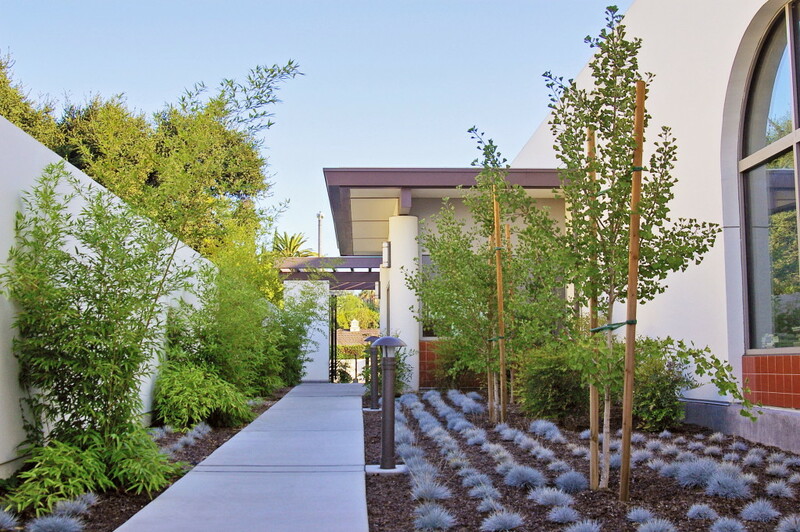 This project is located in Montclair, California. 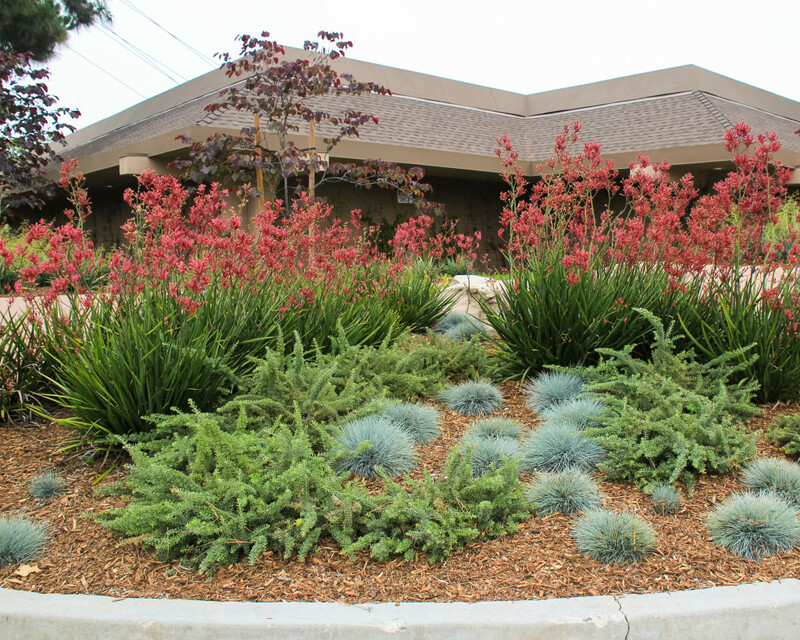 Work included complete landscape planting and irrigation installation. 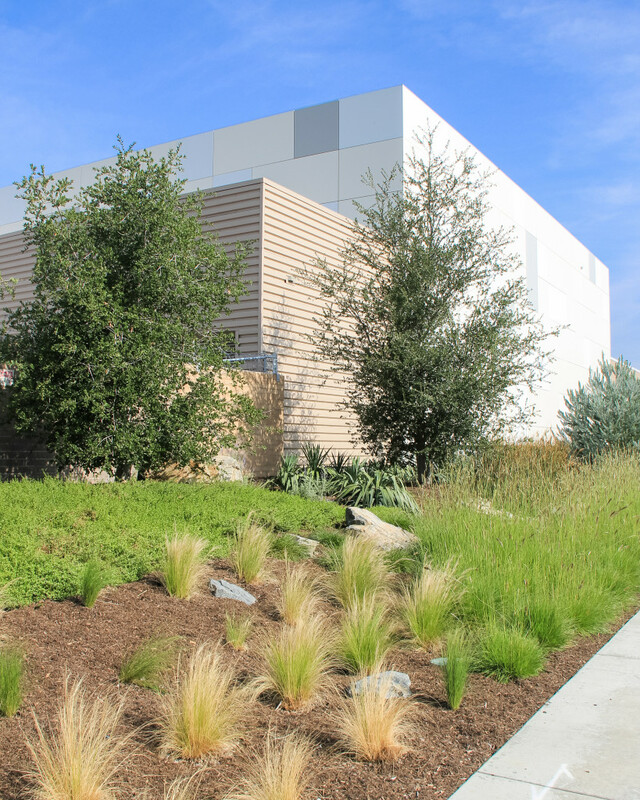 The emphasis on this project was the selection by the city to design sustainable drought tolerant plantings and drip irrigation systems to optimize water savings. 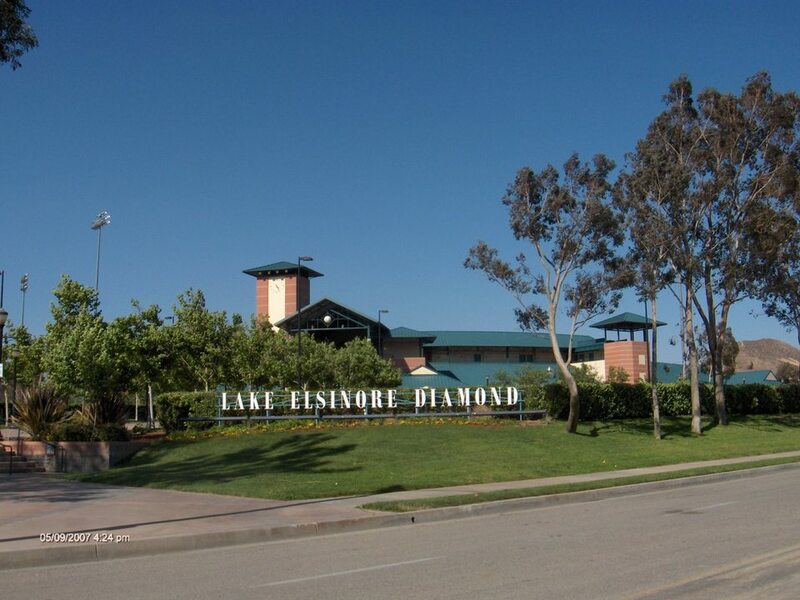 All of the landscape planting and irrigation was included on this project around the perimeter and interior slopes of the baseball stadium located in Lake Elsinore, California. 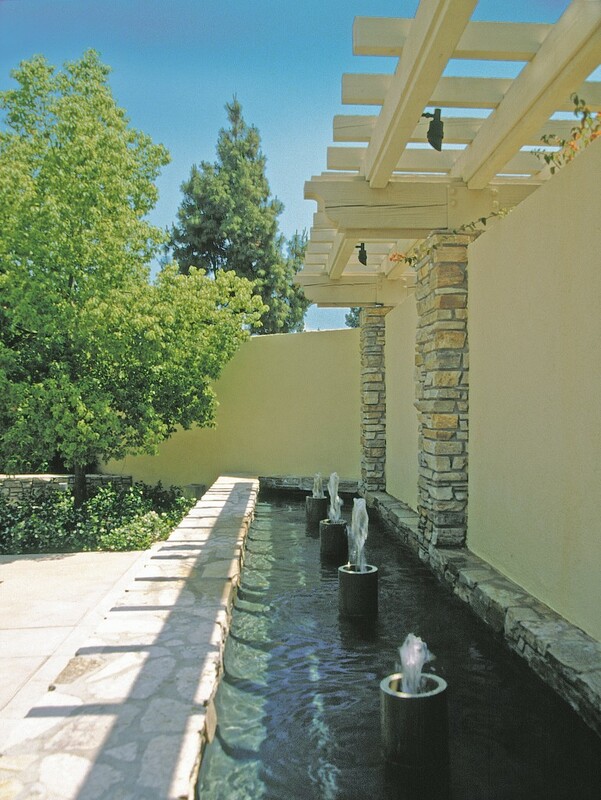 In addition to the landscape, building the centerpiece decorative fountain in the restaurant area was also a part of our work. 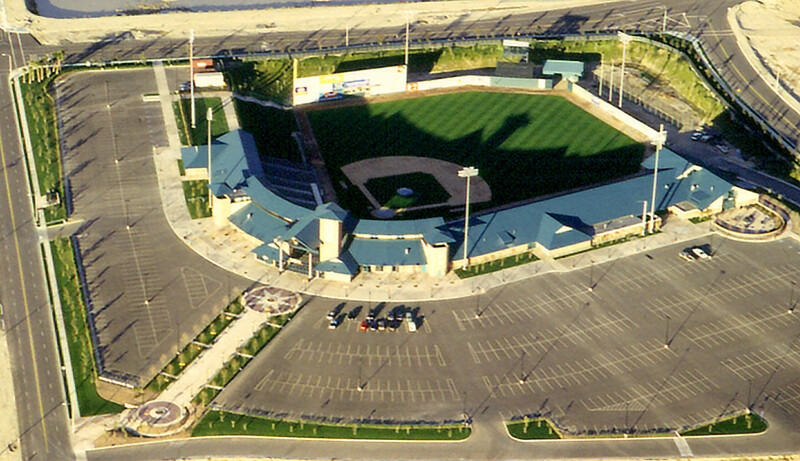 This demanding project had a special challenge of an accelerated schedule where multiple trades had to work simultaneously to finish work before the opening day. 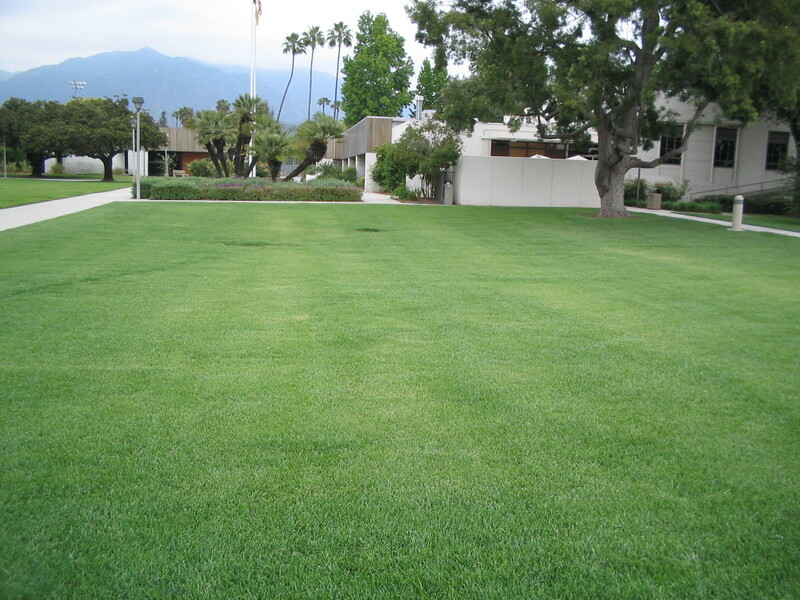 This was the complete landscaping of new headquarters of the Arcadia Police Department located near the City Hall Complex in the City of Arcadia, California. 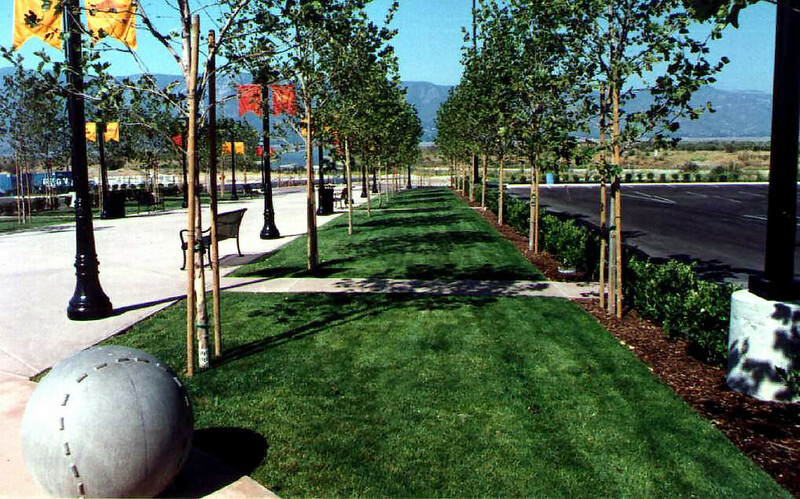 Work included complete landscape planting, drainage and installation of central control irrigation systems. 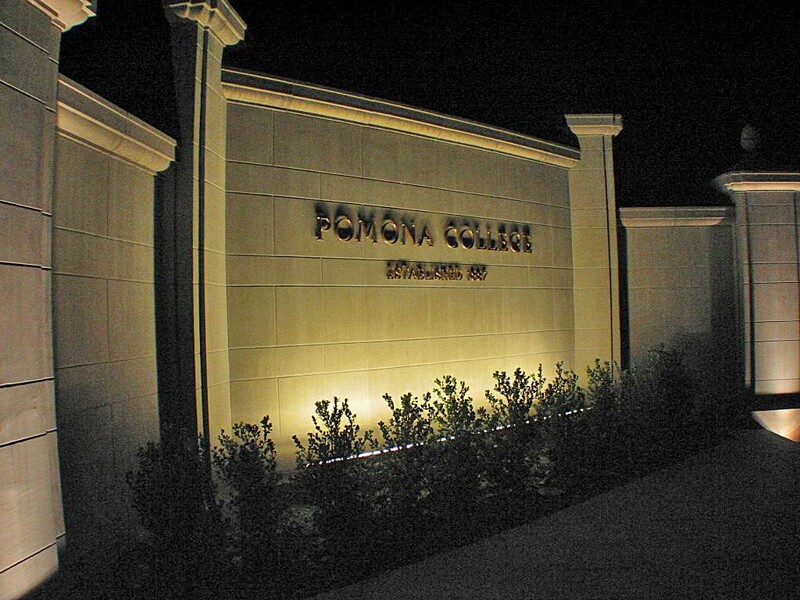 Color concrete as well as custom block wall planters and lighting systems were included. 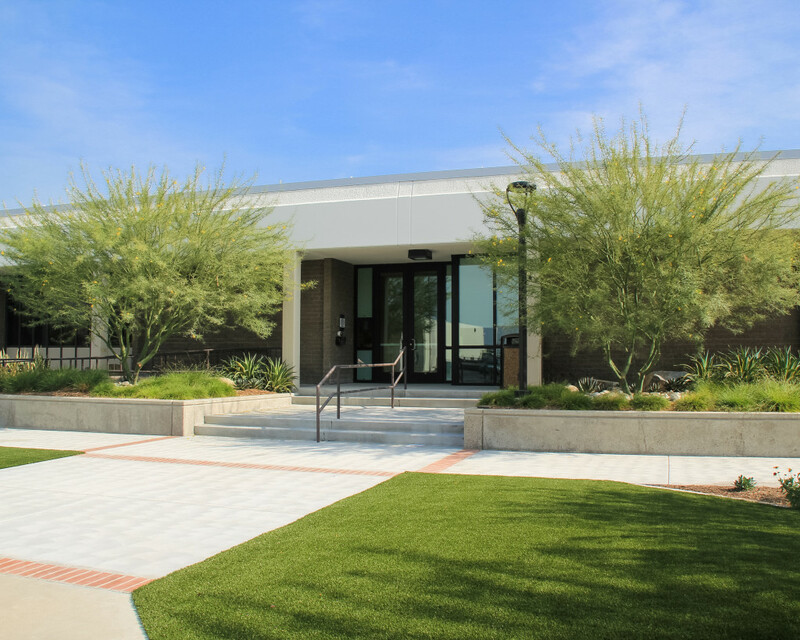 Designed by EPT Landscape Architects, this is a transportation waiting area at the Arcadia Public Library located in Arcadia, California. 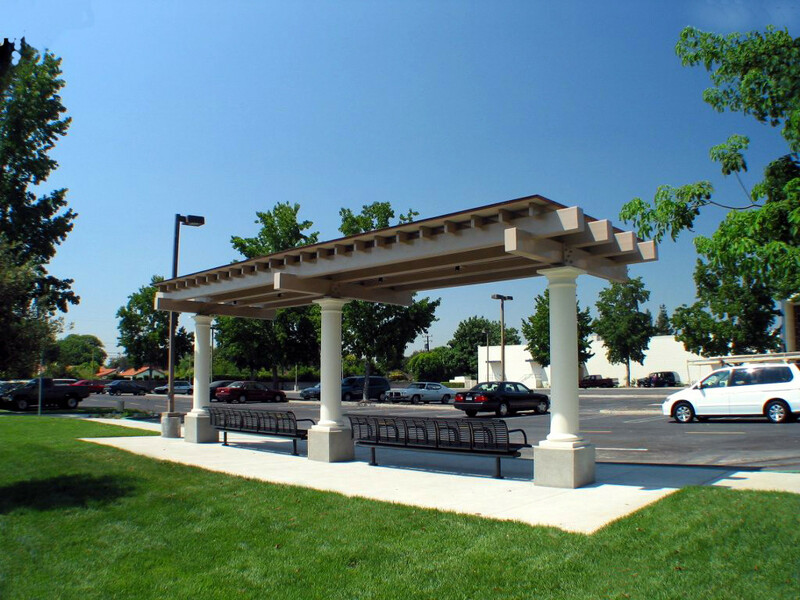 The work included the building of a steel pergola structure as well as amphitheater seating on the lawn. 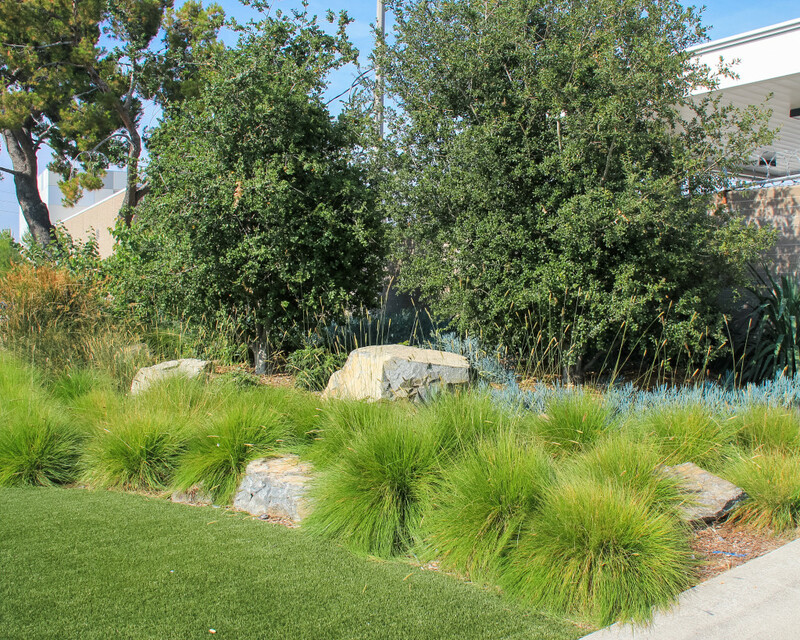 The Eric Substation project was a complete landscape conversion from traditional turf and plantings to a drought tolerant landscape. 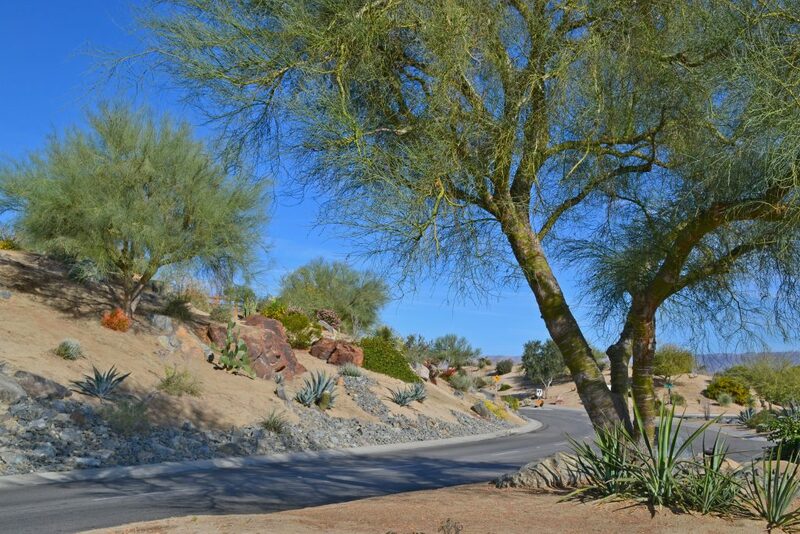 Work included low volume irrigation, native plantings and rock features. 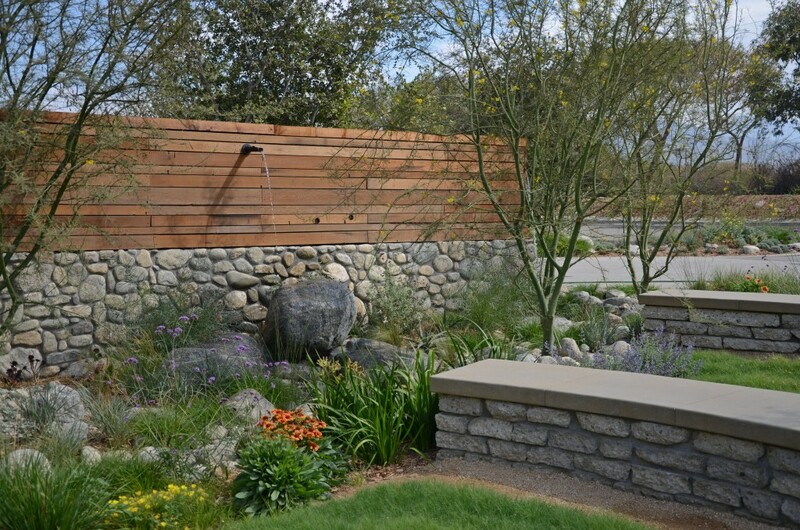 The overall design and variety of plant material on this job really makes it stand out. 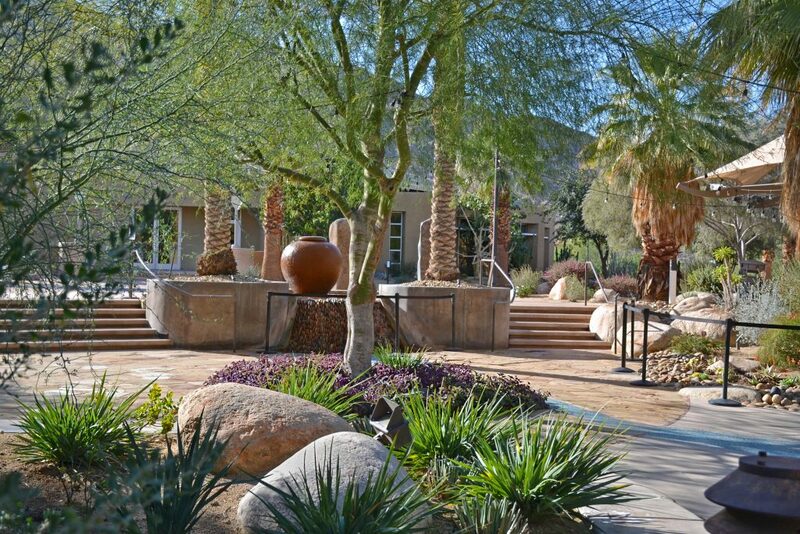 The Palm Springs Art Museum welcomes visitors with a spectacular desert plants garden. 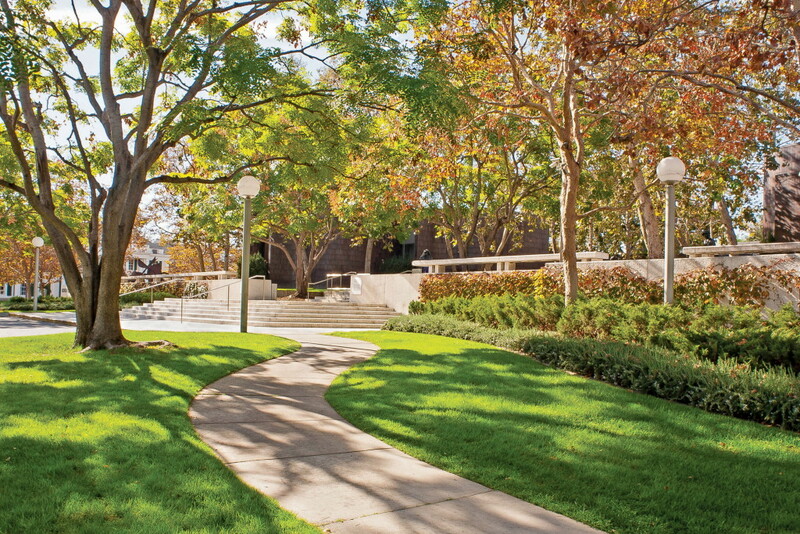 A sunken plaza provides a welcome respite in the Faye Sarkowsky Sculpture Garden. 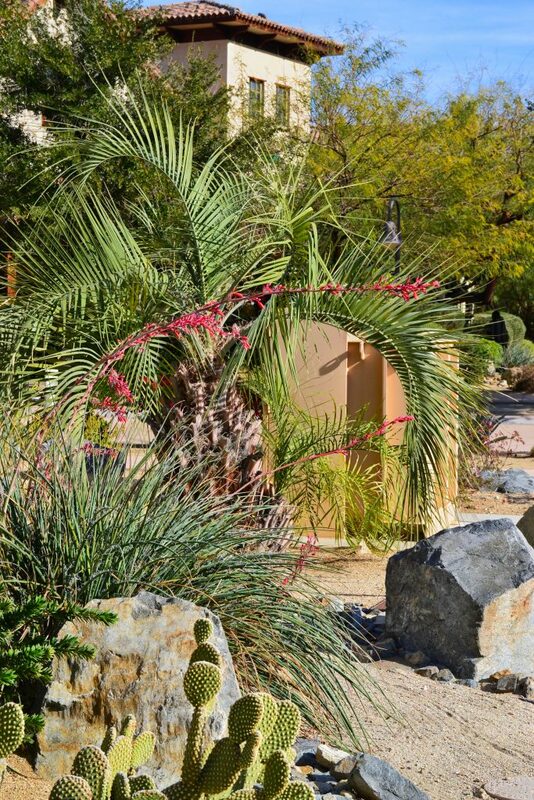 A rock garden with provides the setting for a blooming yucca and other desert plants. 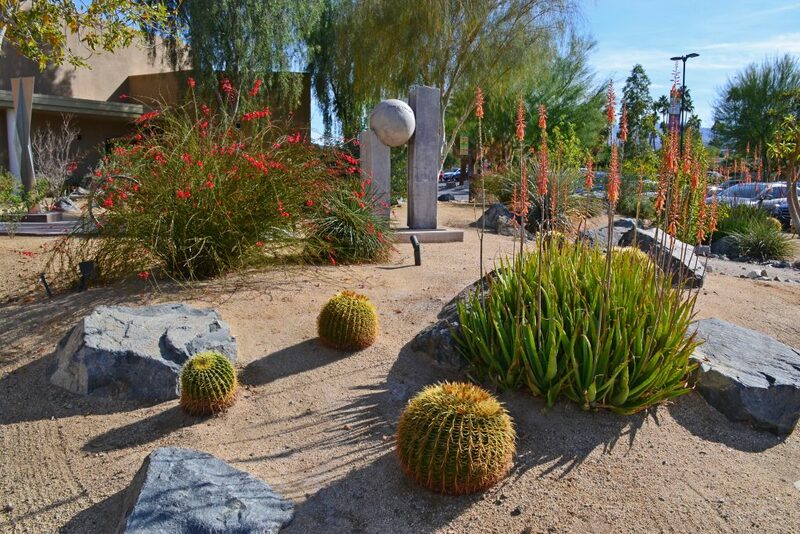 Red firecracker plant, aloe in bloom, barrel cactus and sculpture front of museum. 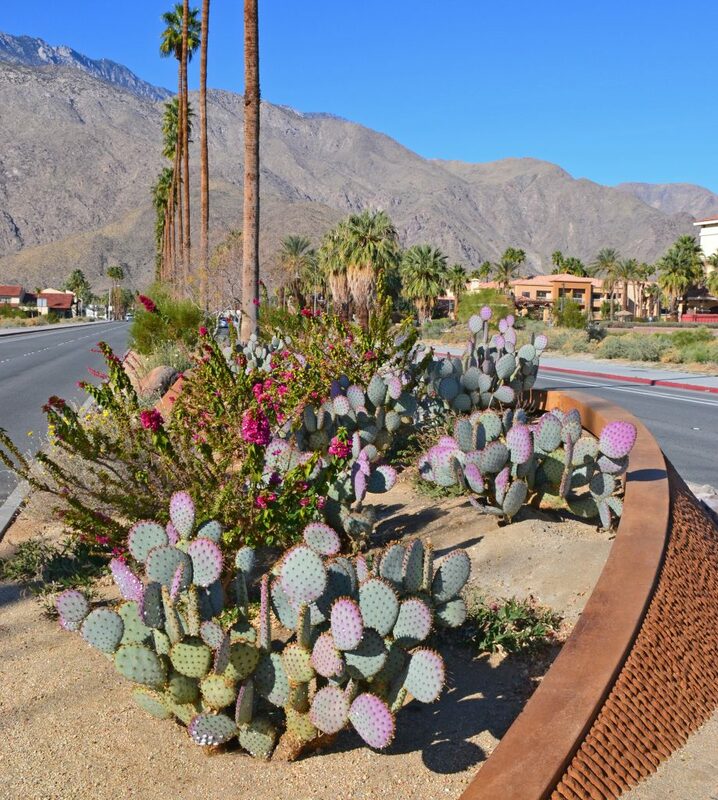 Purple prickly pear, yucca and bougainvillea dress up the Tahquitz Canyon median near downtown Palm Springs. 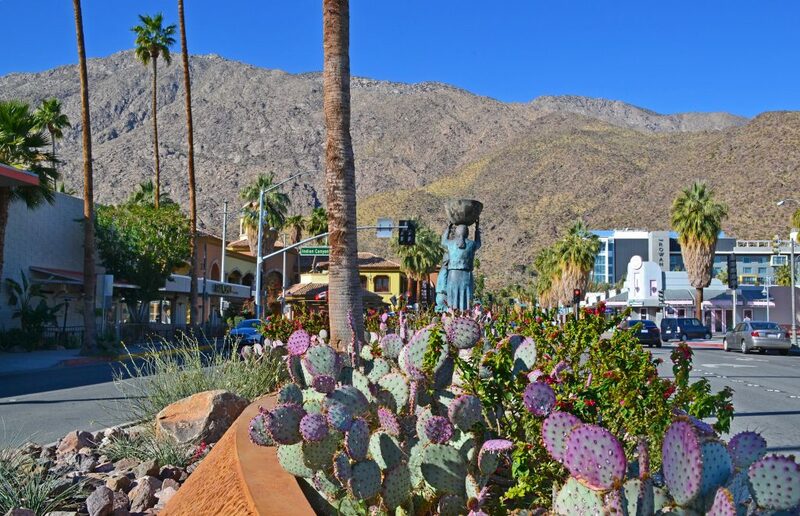 Glowing cholla, brilliant bougainvillea and purple prickly pear dress up Tahquitz Canyon median. 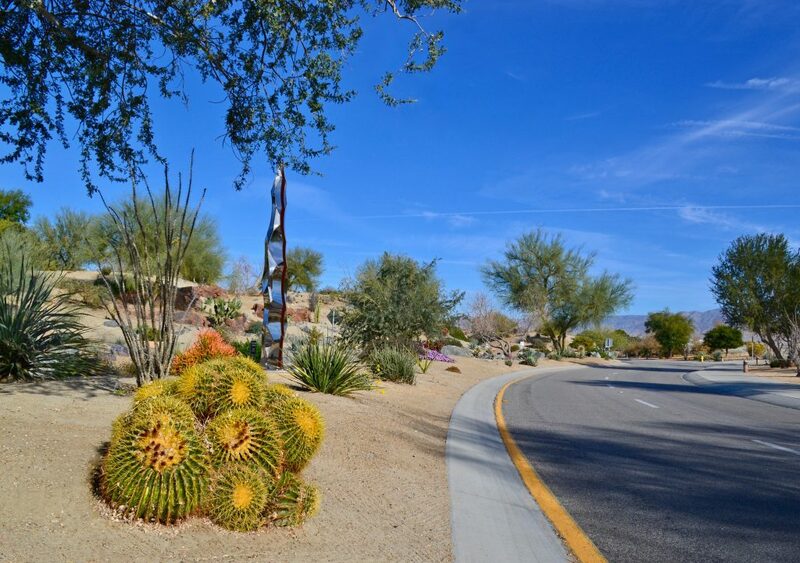 A bouquet of prickly pear, bougainvillea and desert marigold adorn the median on Tahquitz Canyon Way. 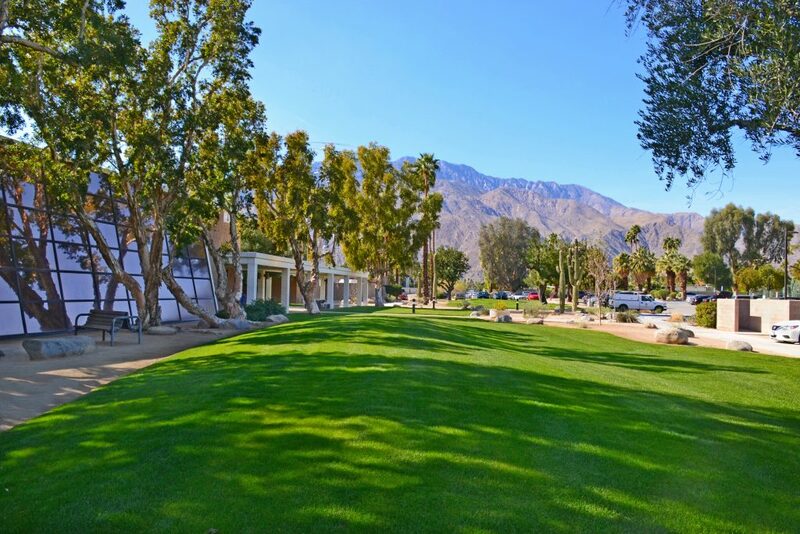 Richly colored bougainvillea offset the green lawn and palms in the Visitors Center oasis. 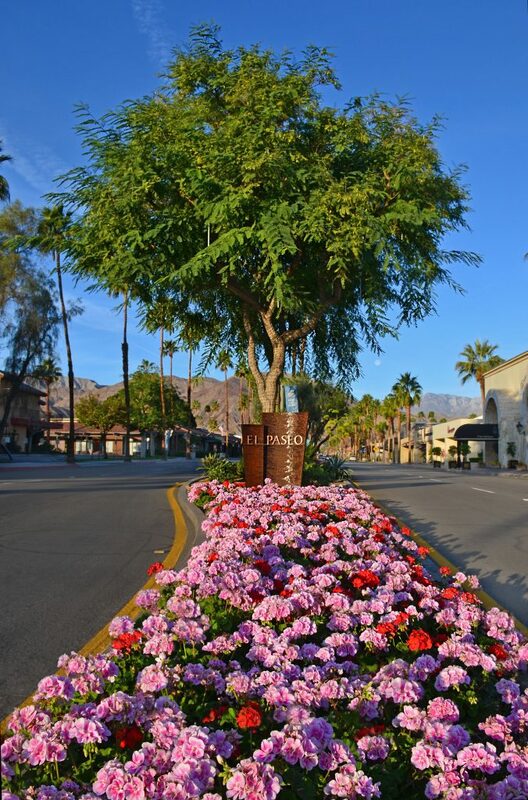 The famous Palm Springs Sign is set in a lush oasis featuring towering palm trees, green grass, and flowering bougainvillea. 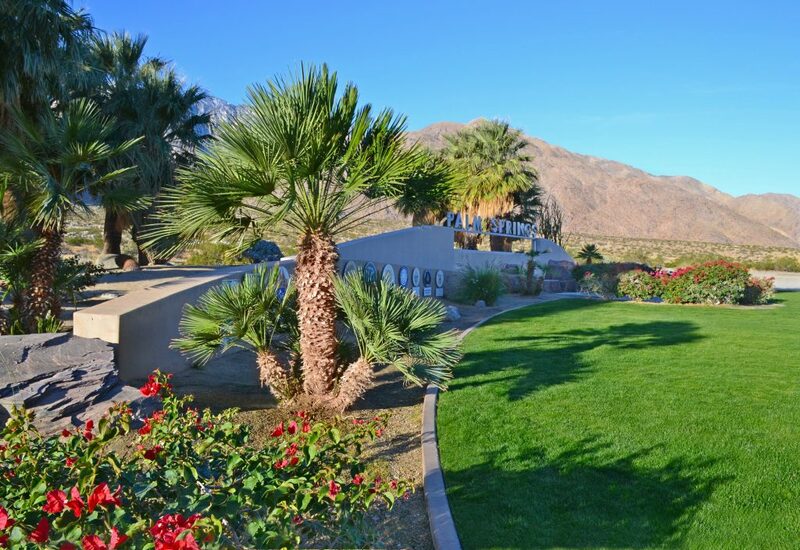 Mediterranean fan palms, brilliant bougainvillea and lush turf create a welcoming oasis. 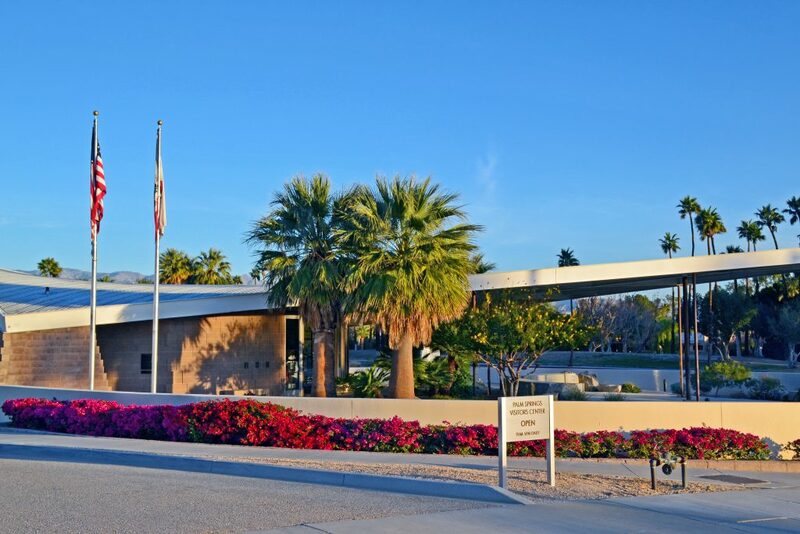 A healthy hedge of bright fuschia bougainvillea glows in the early morning sun at the Visitors Center. 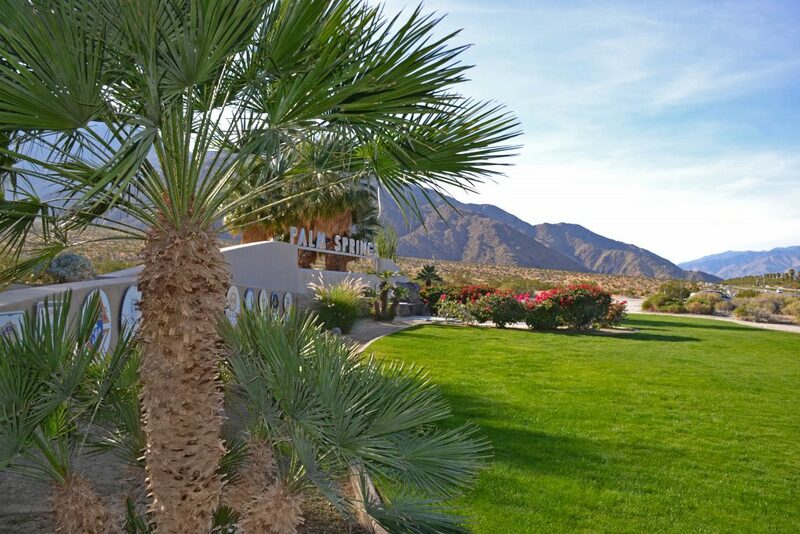 Afternoon oasis lawn bordered by palms, bougainvillea, fountain grass and the San Jacinto mountains. 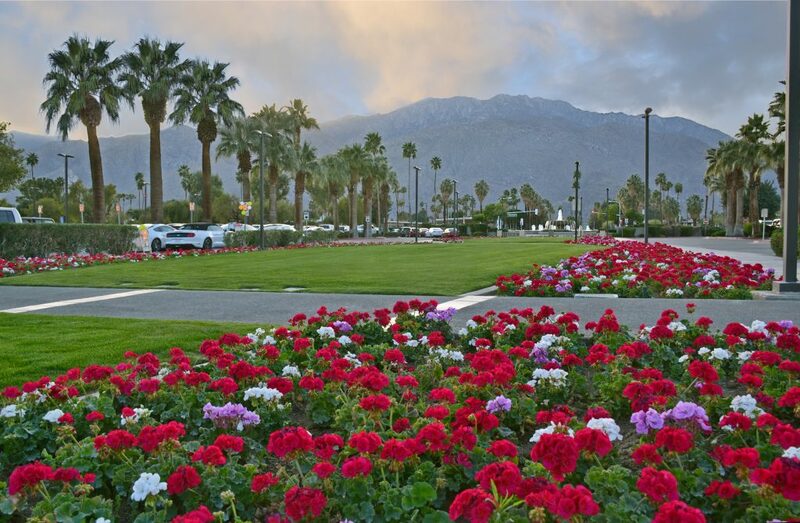 Wide gardens with red, pink and white geraniums flank a large green lawn at the Palm Springs International Airport. 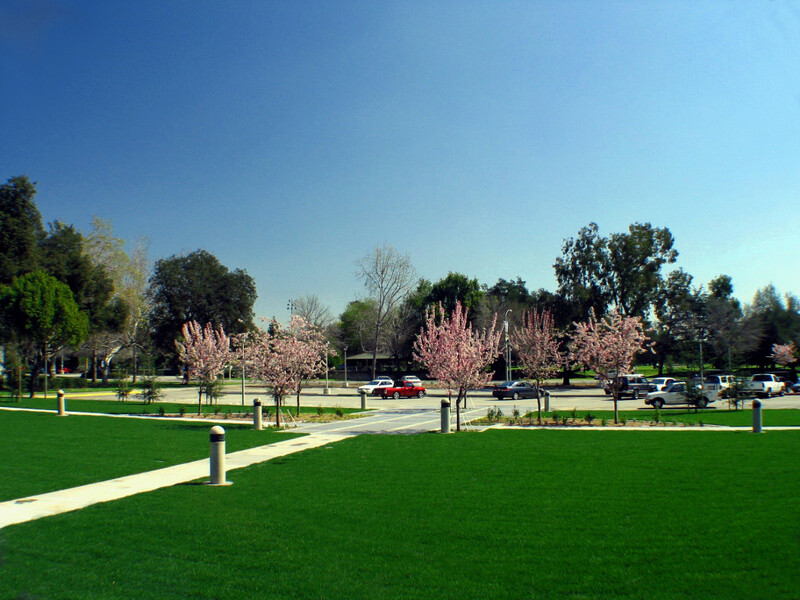 Grass carpets gentle slopes along curving walkways dotted with trees and lantana along airport roads. 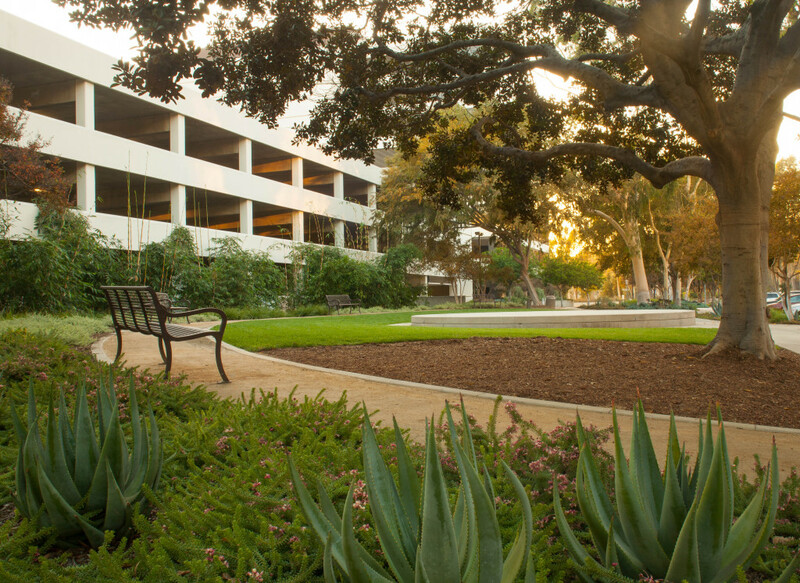 A triangle-shaped garden with oleander and geraniums offsets a swath of emerald green turf at the airport plaza. 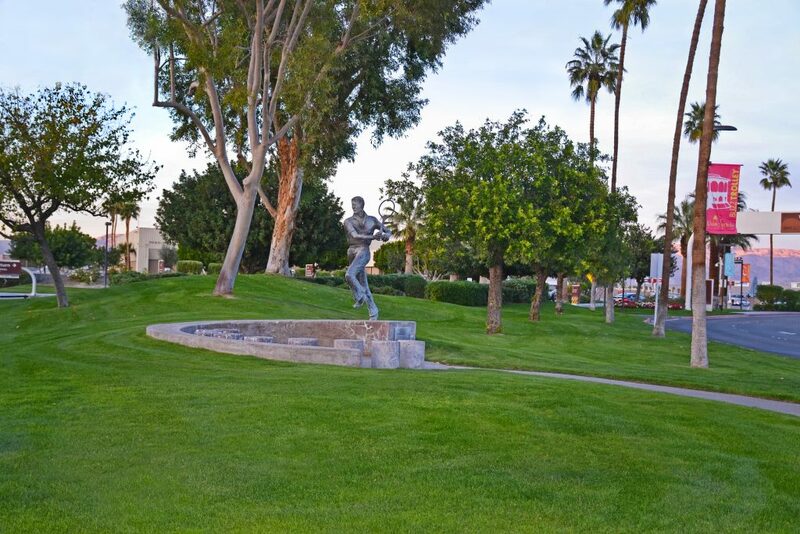 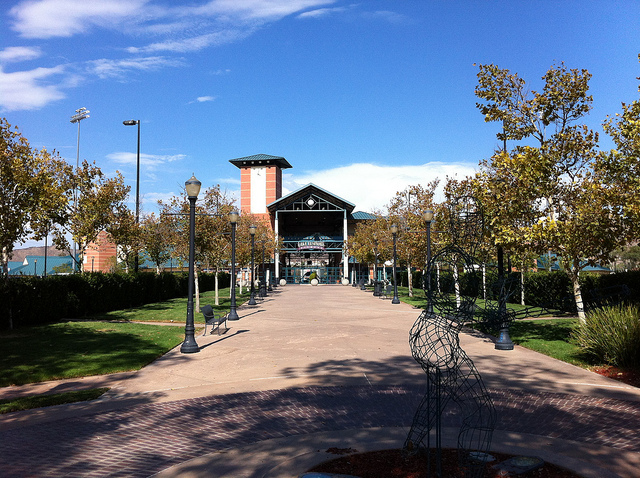 Spacious green lawns, shade trees and a statue of tennis player Chris Farrell border the airport roads. 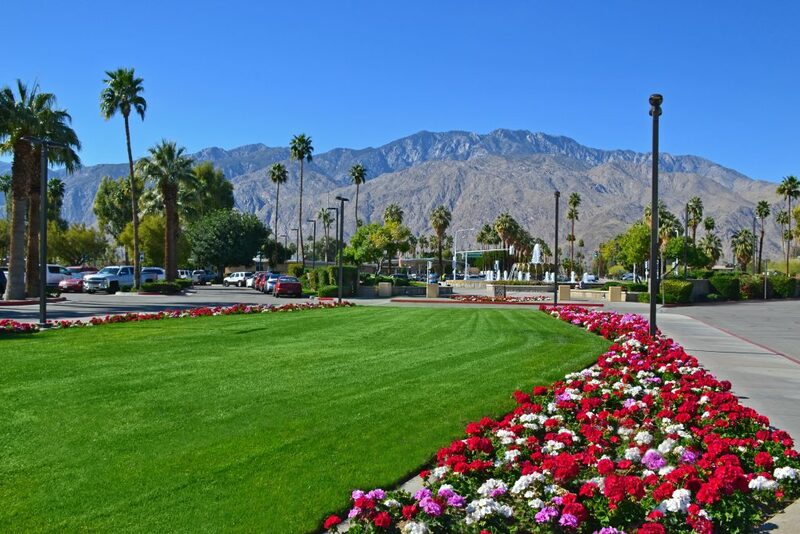 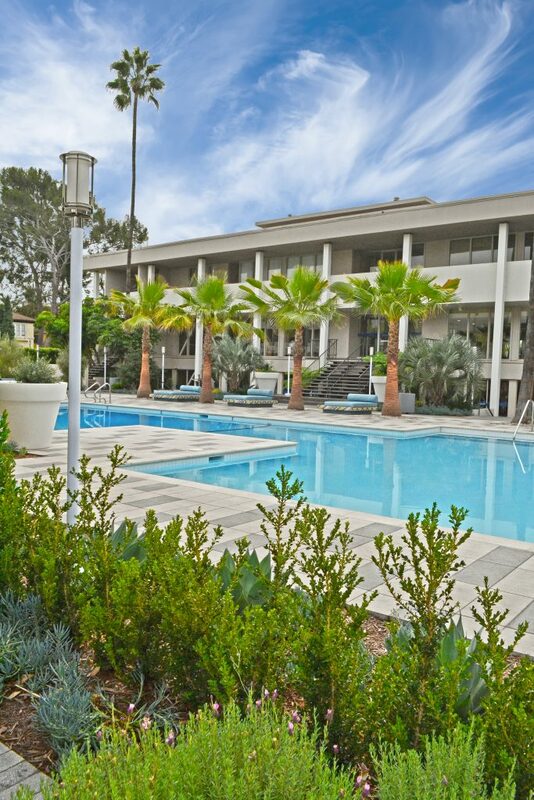 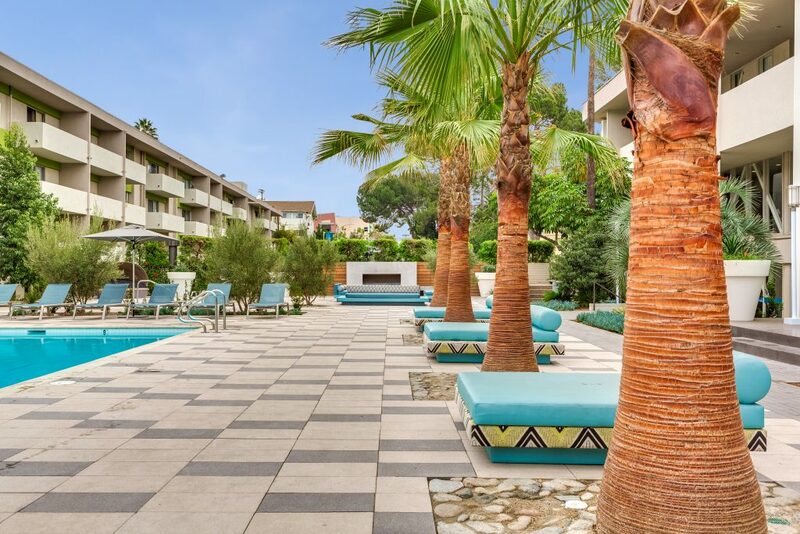 Two spacious green lawns, colorful flower beds and rows of palms provide an inviting setting for travelers. 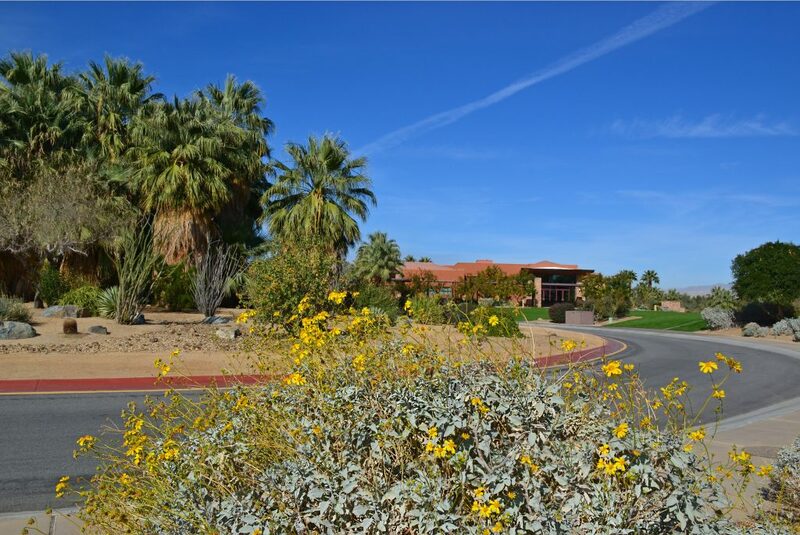 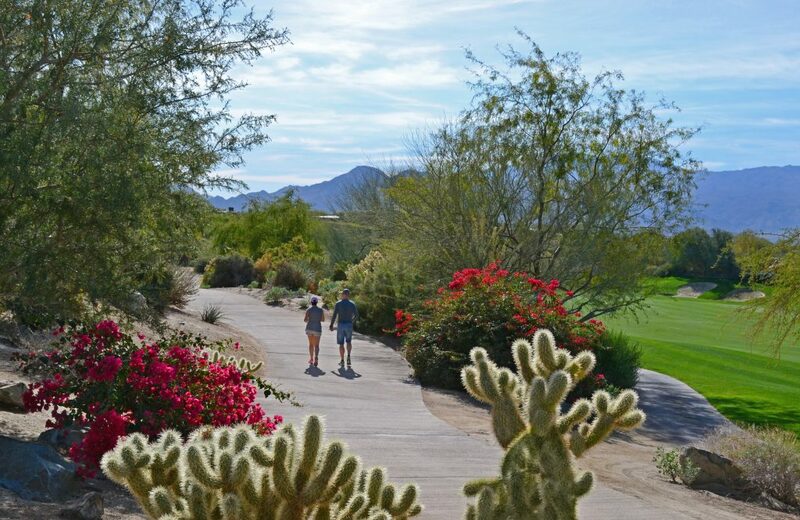 Large expanses of turf and colorful flowers require expert care and smart irrigation to thrive in the desert. 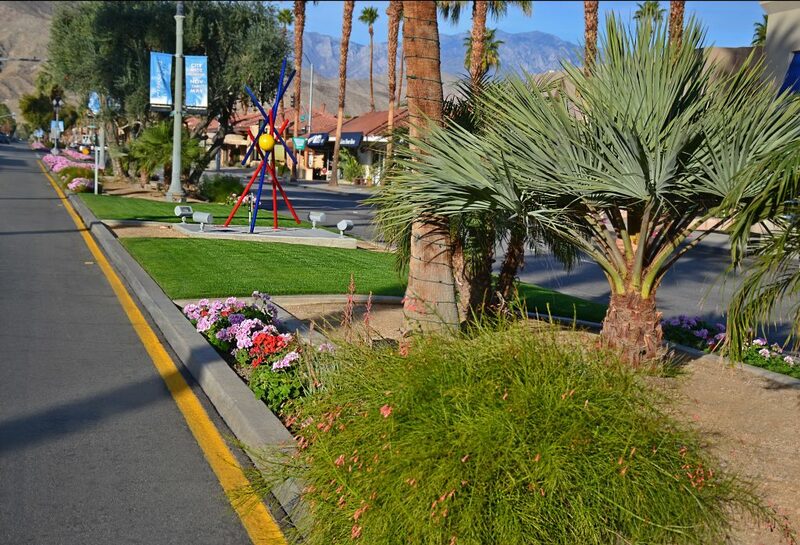 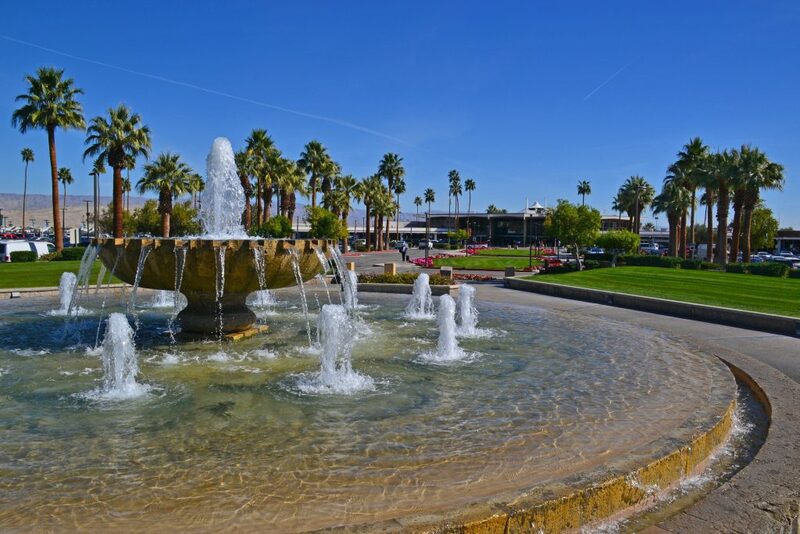 Colorful garden and fountain welcome visitors to El Paseo Drive in the heart of Palm Desert. 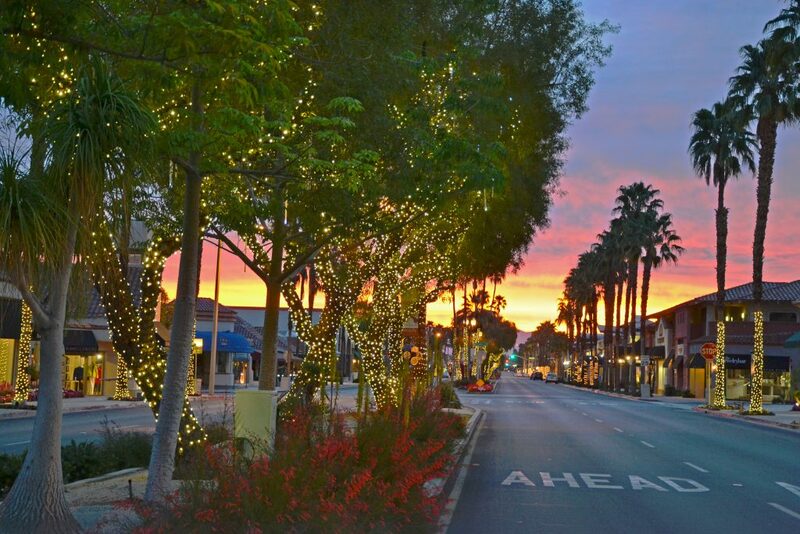 El Paseo Drive glows in Palm Desert at dawn. 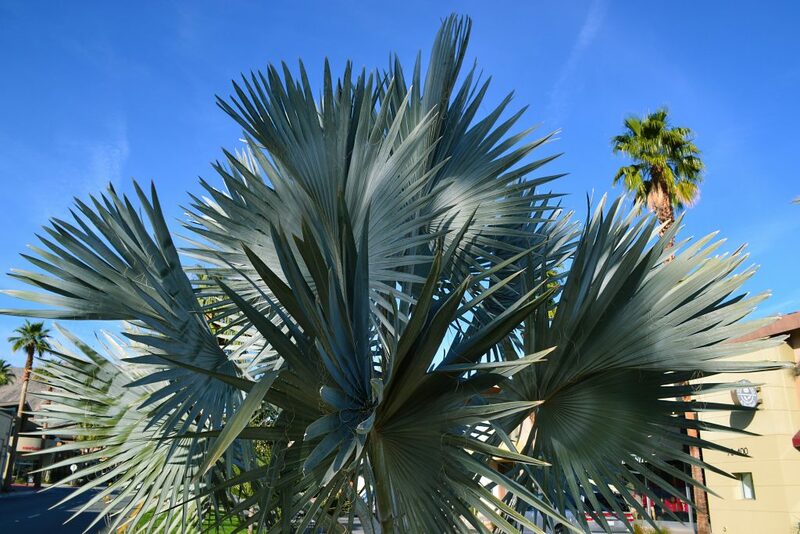 Stately silver fan palm provides a burst of desert beauty. 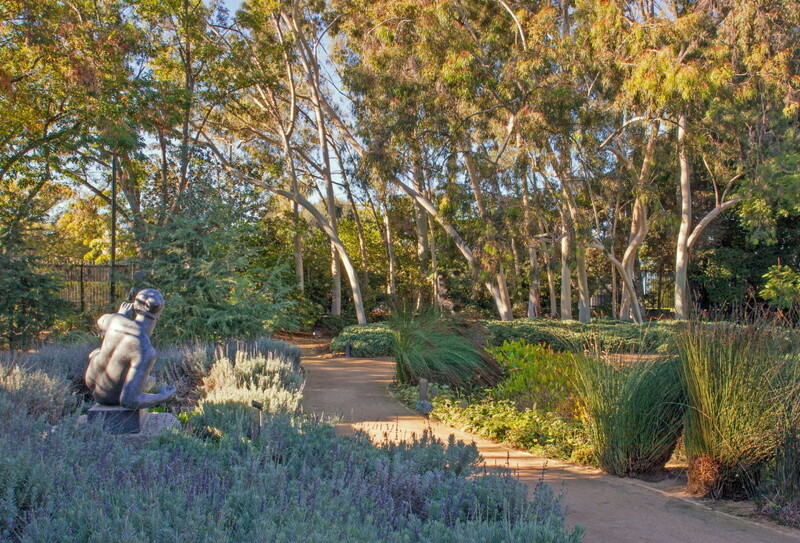 This central landscape abounds with a variety of plantings and a sculpture. 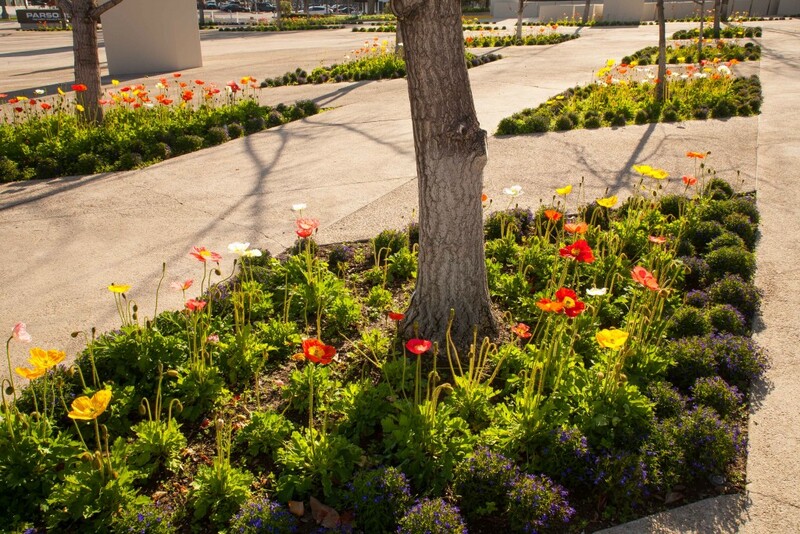 The median is brightened with vibrant blooms and a whimsical sculpture. 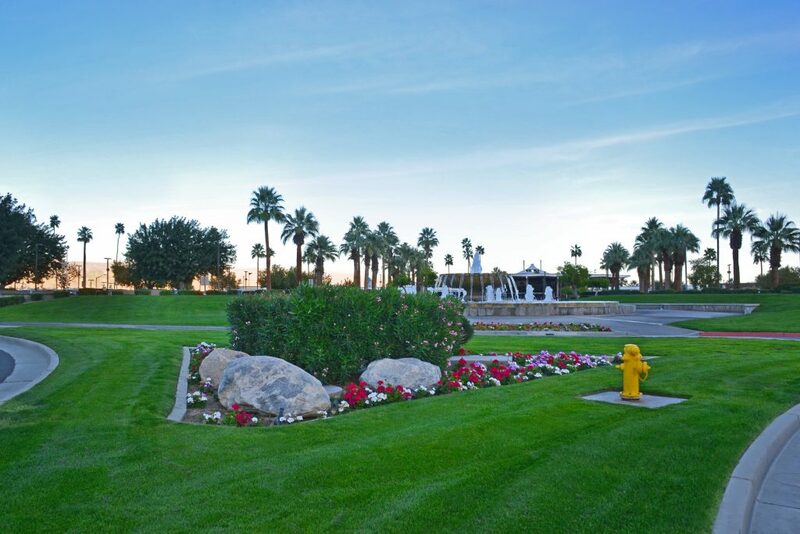 Healthy plants, trees and turf offer natural beauty under Mariposa's expert care. 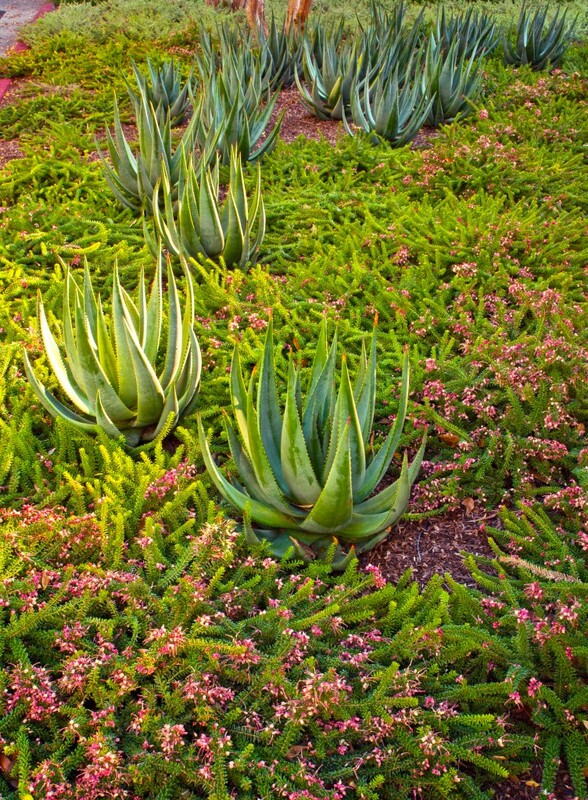 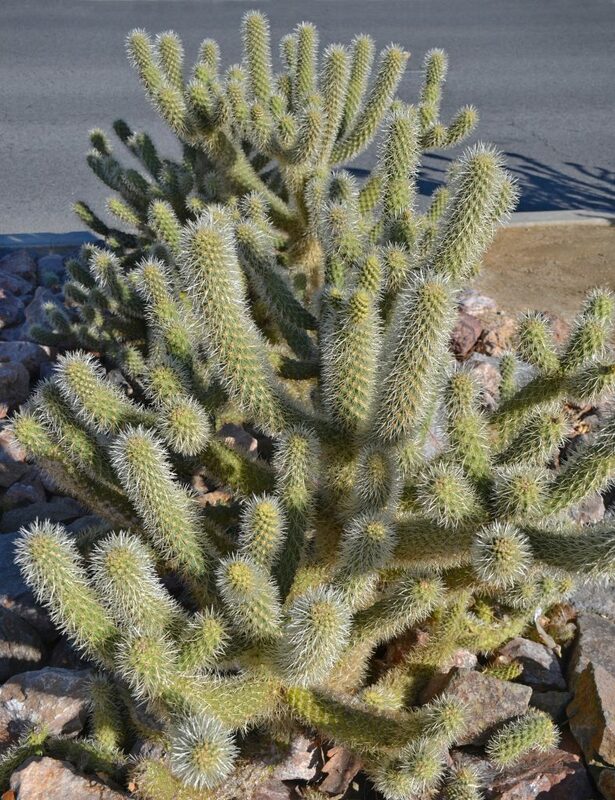 A variety of desert-adapted plants thrive with smart irrigation. 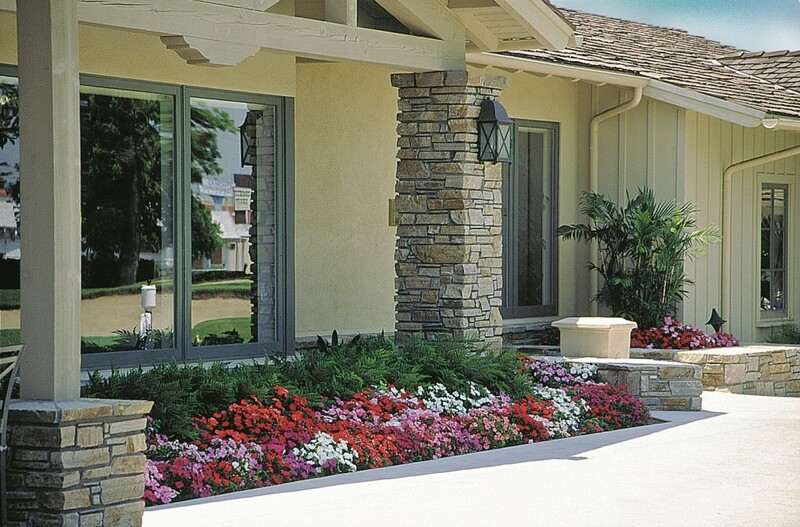 Vibrant blooming flowers are changed seasonally. 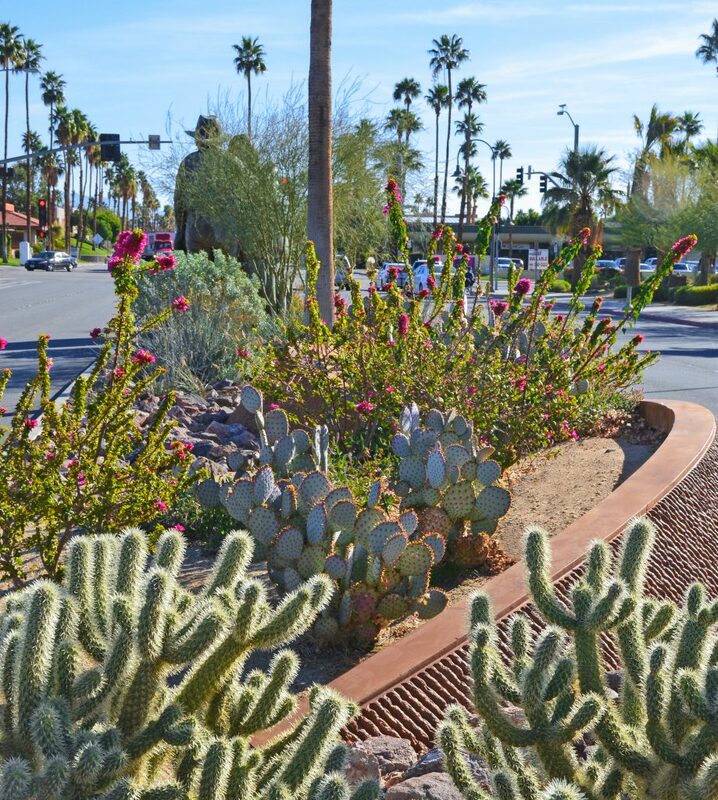 Dramatic median with geraniums, native succulents, cacti and trees. 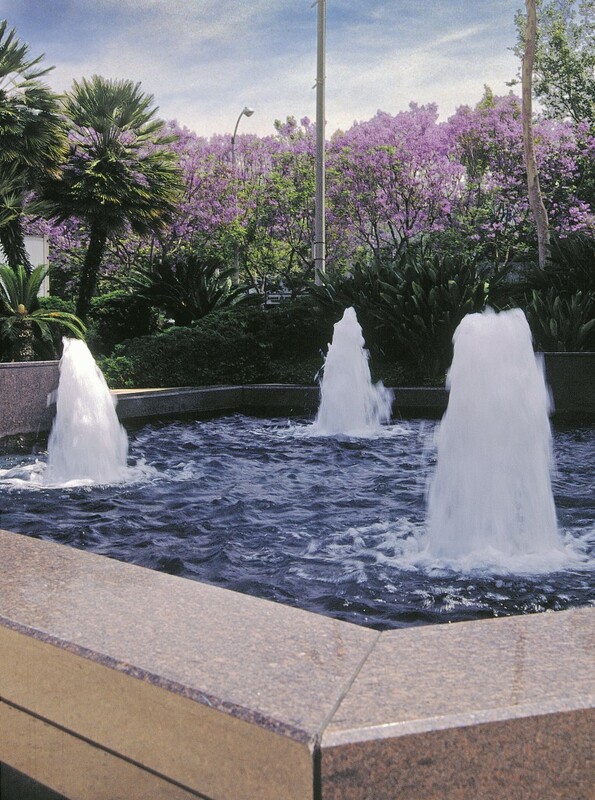 South pool gardens and new pavers.